Sea Ice News – Volume 3 Number 11, part 2 – other sources show no record low Arctic ice extent | Watts Up With That? Note the label at the bottom of the image in red. NSIDC doesn’t often mention this product in their press releases. They most certainly didn’t mention it today. The numbers they give for 80% and marginal ice add up to an extent of 6,149, 305 square kilometers. So who to believe? It depends on the method, and who thinks their method is most representative of reality. Measuring sea ice via satellite, especially when you use a single passive sensor system that has been show in the past to have degradation problems and outright failure (which I was told weren’t worth mentioning until they discovered I was right and pulled the plug) might be a case of putting all your eggs in one basket. I suspect that at some point, we’ll see a new basket that maybe isn’t so worn, but for now, the old basket provides a comfort for those who relish new records, even though those records may be virtual. Note that we don’t see media pronouncements from NOAA’s NATICE center like “death spiral” and “the Arctic is screaming” like we get from its activist director, Mark Serreze. So I’d tend to take NSIDC’s number with a grain of salt, particularly since they have not actively embraced the new IMS system when it comes to reporting totals. Clearly NSDIC knows the value of the media attention when they announce new lows, and director Serreze clearly knows how to make hay from it. But this begs the question, why not move to the new system like NOAA’s National Ice Center has done? Well, it is a lot like our July temperature records. We have a shiny new state of the art Climate Reference Network system that gives a national average that is lower for July than the old USHCN network and all of its problems, yet NCDC doesn’t tell you about the July numbers that come from it. Those tasks were left to Dr. Roy Spencer and myself. It can provide better detail, particularly in some regions, e.g., the Northwest Passage. there is some subjectivity in the analysis – it may depend on the amount of time an analyst has in a given day. Our data is from passive microwave imagery. It is not affected by clouds, it obtains complete data every data (except when there may be a sensor issue), it has only consistent, automated processes. So we have much more confidence in comparing different days, years, etc. in our passive microwave data than is possible using MASIE. Finally, MASIE’s mandate is to try to produce the best estimate they can of where there is any sea ice. So they may include even very low concentrations of ice <15%. In looking at visible imagery from MODIS, in the few cloud-free regions, there does appear to be some small concentration of ice where MASIE is mapping ice and our satellite data is not detecting ice. This is ice that is very sparse, likely quite thin. So it will probably melt out completely in the next week or two. MASIE has tended to lag behind our data and then it catches up as the sparse ice that they map disappears. This year the difference between the two is a bit larger than we’ve seen in other years, because there is a larger area of sparse ice. You can thank the big Arctic storm of August 4th-8th for that dispersal. Trends -vs- records, just like July temperatures. One system might be better at trends, another might be better at absolutes used to determine records. In this case we have three other respected methods that show absolute values higher than that of NSIDC’s older method which they have a high confidence in. I suppose these systems are like children. In a competition, you always root for your children over the children of the other parents, so it is no surprise that NSIDC would root for their own well known media star “child” over that of NATICE’s IMS and NSIDC’s own lesser known child, MASIE. No matter what though, its all just quibbling over just a little more than 30 years of satellite data, and it is important to remember that. It is also important to remember that MASIE wasn’t around during the last record low in 2007, and IMS was just barely out of beta test from 2006. As measurement systems improve, we should include them in the discussion. That’s one reason that, even with today’s announcement that the sea ice reached a new low extent for the satellite era, I wouldn’t bet that “the Arctic is all but certain to be virtually ice free within two decades,” as some have proposed. I’d say fifty/fifty odds, at best. The main point is that NIC works with images, while the others are microwave products. Some have analyzed the underestimation by microwave products. Anthony, some one pulled me up for the mis-use of the phrase ‘begs the question’ a few weeks ago. Begging the question (Latin petitio principii, “assuming the initial point”) is a type of logical fallacy in which a proposition relies on an implicit premise within itself to establish the truth of that same proposition. In other words, it is a statement that refers to its own assertion to prove the assertion. Such arguments are essentially of the form “a is true because a is true” though rarely is such an argument stated as such. Often the premise ‘a’ is only one of many premises that go into proving that ‘a’ is true as a conclusion. MASIE and IMS are the same thing – MASIE takes its sea ice data from IMS. So you can’t count it twice. It’s also misleading of you to mention MASIE / IMS without saying that it currently has 2012 as lowest on record for the time of year (lower than 2007) – it just hasn’t set a new record yet. Finally, the melt season is not over yet. Will you put up a new post with equal prominence if/when MASIE also shows this year as a new record? Has NSIDC ever been audited? Are their practices, their procedures compliant or according to ISO standards and are they available for inspection? Seems to me we were not questioning the method when it didn’t show “record lows”. I’d be much more interested in two things; 1) Why is it low this year and 2) do we really have sufficient years to be stating record anything? Why not ask an Eskimo? I have said it many times on this blog before and I will repeat myself. Please wake me up when something interesting happens at the North pole. Perhaps finding the pot of gold at the end of the rainbow and even Santa’s grotto. Otherwise the ice will do as the ice will do. And there is no doing anything about it. I’ll make a few points for clarification on the post above. First, MASIE and IMS are the same product. MASIE is simply a repackaging of the IMS data in easier to use formats. IMS is produced by the National Ice Center (NIC), using similar sources and methods as they use for their daily interactive maps. So all three of the examples provided are closely related and not independent measurements. 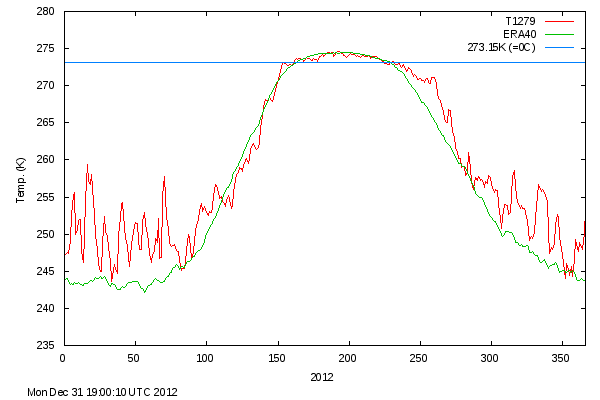 The passive microwave estimates all show a record low for the Arctic. These aren’t completely independent either – they all measure microwave emission, but there are difference sensors (SSMIS, WindSat, and for the first time AMSR2: http://www.eorc.jaxa.jp/en/imgdata/topics/2012/tp120825.html, which is pretty exciting), and there are different processing methods as well. There can always be potential errors in data, especially in near-real-time, so having multiple sensors showing consistency provides confidence that one sensor doesn’t have an error, which has happened from time to time. When it does, we go back and reprocess and correct the errors. I worked at the National Ice Center for a couple years and have collaborated with them many times since, so I’m familiar with their methods and their focus. Their mandate is to map as much as ice as possible as accurately as possible each day and week in support of ships (particularly DoD ships) operating in and near ice-covered waters. They work hard on getting today’s data analyzed and then tomorrow they start over. They are not concerned with the past. If they can detect more ice today than yesterday, then they map it. If they lose a sensor, they do the best they can with what they have left. If they make an error, they don’t go back and correct it -it’s on to the next day. NIC doesn’t discuss climate or climate change because that is not their purpose and from my experience working there, they just don’t have the time – they’re focused on the here and now. The charts are produced manually, so there is subjectivity in the analysis that we don’t have in our fully automated processing. This means that there can even be inconsistencies in adjacent regions if they were analyzed by different people. They have created an archive of their weekly ice charts, which is archived at NSIDC: http://nsidc.org/data/g02172.html. There was some attempt to homogenize the charts (at least remove regional discrepancies) during the production, but they do not produce a consistent timeseries. MASIE, though it only goes back to 2006, has similar issues of consistency. The folks at NIC do a great job at what they’re focused – navigational support. MASIE is an excellent data set and we at NSIDC find it very useful looking at specific details about the ice (e.g., is the Northwest Passage open or not), but the NIC products are not applicable to studying climate-scale changes. REPLY: Walt, respectfully, MASIE says 4.7, IMS says 5.1. If MASIE and IMS are the same product, how can they show different numbers? In your “repackaging” don’t you manage the IMS data to your methods in some way, resulting in a different end number? The differences in the 4.7/5.1 would seem to suggest you drop out some IMS data. IF IMS products are only useful for navigation, why give a total extent value? As for “usefulness in studying climate” no data set just a few years old can be useful for trends. They can however be useful for absolutes. For example you cite the new AMSRE2 data in that context. At just over 30 years old now, SSMI data used by NSIDC/CT is just barely above the threshold for a climate capable data set. I suppose NSIDC would be a lot more believable to me if Serreeze wasn’t so focused on making pronouncements. Looking at Anthony’s comments, perhaps one further clarification that may arise from my previous comment. The MASIE product came out in 2010; historical data was run going back to 2006. And again to confirm, MASIE and IMS are the same product. There may be some slight differences in numbers because of how the data is gridded and projected, but they’d be minor. i agree with you that the data gathering methodology is certainly suspect, but it is interesting to me that there are several sources catching this extremely low amount. I still would be surprised to see a “real” record low show even on the alternate sources. But here’s the kicker… does that mean we’re a-roasting? I don’t think so. Global average temps are sliding now +.28C, which is not much at all, and the cumulative anomaly from January to July was just +.001C (Dr Ryan Maue, Weatherbell.com) which is basically nothing. Further, the history you occasionally post yourself indicates periods that were quite ice-free in the Arctic within the last century, and we had cold winters then and hot summers then, as now. I guess we’ll only really know when it’s all done. Keep up the good fight! Thanks, Anthony. Good to know about the National Ice Center – IMS Products. 27 Aug: Washington Post Ezra Klein’s Wonkblog: Brad Plumer: Could a carbon tax help the U.S. avert the fiscal cliff? With the United States facing the expiration of a slew of tax cuts in 2013—the dread “fiscal cliff”—there has been plenty of interest in offbeat tax-reform proposals. And one idea that a few economists keep knocking around is a fee on carbon emissions. After all, if we need to raise revenue, why not just tax global-warming pollution? According to MIT calculations, a modest carbon tax, on its own, wouldn’t get the United States close to that longer-term mark. It might make sense as a more economically efficient way of raising revenue. But the tax would either have to be hiked dramatically or combined with other clean-energy measures in order to make a significant dent in tackling global warming. WUWT is my first morning read. may not be an accurate indication of the Artic ice conditions! I wondered each day when material would appear and 8/27 is finally the day. Why question the method only after a new record low has been reached? It harms your credability as an objective observer. REPLY: Because these are new methods that aren’t getting any attention. MASIE wasn’t around in 2007, and IMS was just barely out of beta test. Measurement of sea ice from space is not an exact science, as these different methods show. As an objective observer I reported on NSIDC’s numbers first, then I point out that other newer data sets show different values. A non-objective observer would have only reported one side of the story, I reported both. How many news article report both sides of the story on sea ice today? So, not being a trusting person … I went to the sources. Masie is reporting 4.7 million square kilometres of ice, and NSIDC SII 4.1 million square kilometres. Nasie has 4km resolution, SII 25km resolution. Back in 1963, surveillance satellites used in the Cold War could find an object 2 feet wide on the ground. Now the best we can do to monitor ice is either 25km or 4km resolution. Anyway, let’s say that the 600,000 square kilometres of ice that the SII can’t see is less than its reported 15% ice extent. 7.5% for assumption. And, let’s say it is half the thickness of its lowest reported thickness of 0.5 metres. So, 0.25 metres thick (25cm or 10 inches). So, 600,000 km2 X 7.5% is 45,000 square kilometres of ice 25cm thick. A square kilometre is 1 million square metres. So, 45 billion square metres of 25cm ice is 11.250 billion cubic metres of ice, or about a trillion cubic feet. Seems like a lot of missing ice to me! Compare: The BP oil spill in the Gulf of Mexico was 0.00078 billion cubic metres of oil (780,000 m3 of oil vs 11,250,000,000 m3 of “missing” ice). That’s only 14,423 BP oil spills of ice missing from the SII data set! The proven oil reserves in Saudi Arabia are about 27 billion bbls, which is about 4 billion m3 of oil or about 1/4 of the missing ice. I go ice fishing on a lake in Canada every winter. 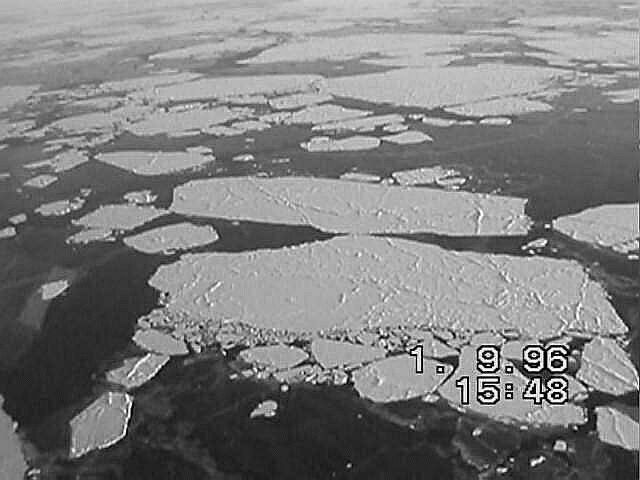 It is 15 square kilometres and the ice gets close to a metre thick. So, 15 million m3 of ice in that lake is a rounding error in the missing ice world of the NSIDC. I’ll have to tell my buddies next winter to forget taking the ice auger, that lake is ice free according to the US government! We can just go and drop our lures and catch some fish! Anyway, the MASIE site breaks down the ice by region. For example, the Beaufort Sea shows 300,700 square kilometres of ice, which is a huge drop from a couple of weeks ago. The steep drop indicates something other than temperature melting the ice, perhaps this “famous” storm. The Chukchi sea has its second highest sea ice extent in the most recent 5 years (which is what is graphed on the site). 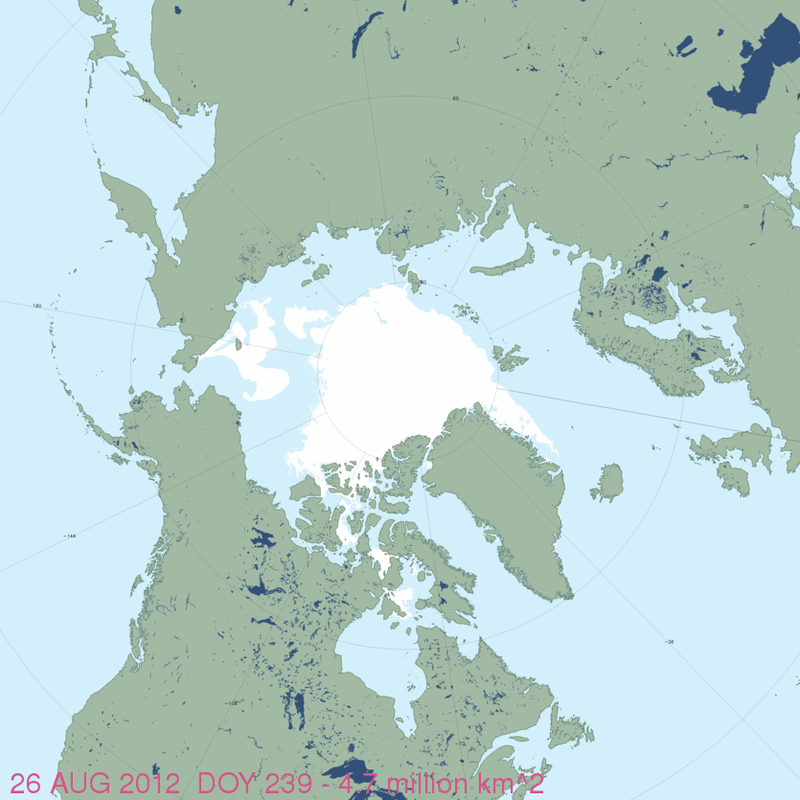 In contrast, Hudson’s Bay is showing its highest extent in 5 years at 67,400 km2 of ice. 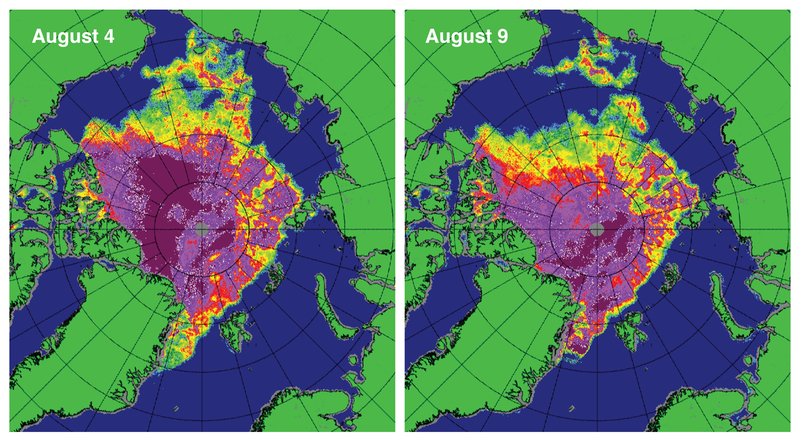 And the Central Arctic, which is where the thick ice is, is showing over 3 million km2 of ice extent. The Central Arctic is almost exclusively north of 80N. At 82.3N, the northernmost reported Canadian weather station shows a daytime high of -1C today, so it looks like the melting season has ended there. It was a whopping 3C over the weekend and below zero last week as well. The ice there is 4.5m thick, so it is unlikely to completely melt any time soon. November mean daily temperatures average -20C, and by the end of the first week of September Alert Nunavut won’t see anything exceeding 0C until the end of May. But, isn’t this all to do about nothing? Natural variations in sea ice extent account for all of this. We only have 30 (or 43) years of satellite measurement of sea ice extent, during which time the instrumental record of temperatures shows a cyclical high, although for North America the 30’s were significantly warmer and parts of the 50’s were close. If ice extent gets under 3 million square kilometres, then it’s an event. Until then, no one should be excited. What was the Earth like before there was an Arctic? Extra points: When did the Arctic start? All this moderation! I thought you were on a much needed vacation. Can’t some of the trusted moderators handle some of the snide/inaccurate remarks while you get some much needed rest? It’s not often that you see schlep this bad presented as a counter-argument. Bad angle, Tony T. Your forecast of the end of the ‘Modern Global Warming Period’ is like something else … on fire. How do sea shell fossils exist at 2500 feet in the Oregon coast range? Sorry, it means arguing in a circle. Check out the bible of logic texts, Irving Copi’s Introduction to Logic. I began teaching from it in the Sixties. Also, the fallacy’s pedigree is pretty long. It goes back to Socrates in 400 BC. The growing misuse of “begs the question” comes from some muttonhead TV talking head who thought it must mean that the discussion so far has reached a point where another question, an additional question, begs to be answered. That use is growing in popularity. But don’t try it around anyone who is familiar with logic. I find it a bit odd of reports Arctic shipping took advantage of the worst Arctic storm in living memory. Sorry, I probably should’ve pointed out that the IMS number of 5.1 is if you look at the graph for August 22. That IMS plot only gets updated once a week I believe. MASIE is updated daily and the extent has declined since the 22nd. I also didn’t point out that MASIE is a single day number while IMS is a three-day average, so that will be somewhat different. But: they are exactly the same product. Same input data, same analysts working on it, same final results. ps – someone else may have caught this already, but I have to head out and don’t have time to read through recent comments to check, so apologize if I repeated something that’s already been addressed in the comments. There was less arctic ice for a period of over 400 years when the vikings were farming Greenland. If this current situation continues for 400 years then I might start to get concerned. IMS stops at 8/22 while MASIE is currently at 8/26, a difference of 4 days. It also appears that the IMS graph uses a 2-day smooth versus tha MASIE daily values. I get 5.14 for IMS on 8/22 (using 8/21 and 8/22 MASIE dailies). No, it was meant for you here. hth. I’m not sure if it’s a trailing mean (average of days 233/234/235) or centred (average of 234/235/236). It doesn’t actually matter since both happen to give the same result for the 22nd, and it’s 5.1 as stated on the IMS graph. Darn. It doesn’t look like I’ll be able to water ski at the North Pole this year. Maybe next year. Anyone have a jet ski they wouldn’t mind bouncing into baby icebergs that’s capable of hauling a waterskier? – I can only download 4 weeks worth of data from the link in your post. Is 4.7 million sq km a record as measured by MASIE? I don’t know, I need the whole dataset! You certainly can’t compare it to the 4.1 million sq km calculated using a different method. Additionally, IMS is tracking at a record low for the date, isn’t it? That’s too easy and doesn’t require the expenditure of 10^7’s$ to support the apparatchik. I don’t want to turn this into an English usage thread. But I think you will find the wikipedia reference is correct. FWIIW, I decided to no longer use the phrase because it is so widely ‘misused’. That’s about as swift as your IMS=MASIE responses. Go check your notes on how the funk in the Solar Cycles will put an end to the warming Tony. Or parrot another weak response, your choice. Kind of unseemly to insult your host, don’t you think? But then …your choice. The phrase that used to be used in that situation was, “That raises the question.” That’s the phrase we should revert to. It does the job and it doesn’t step on the toes of the other phrase, which has a specialized meaning. It does look pretty ugly – meaningless – but I think a new record low will be set in 2012. I think the neglect of people to talk about the Medieval Warm Period when talking about Arctic ice is sinful. Well it is interesting that the claims are of a record low, while the Seattle Times has an article about drilling in the Arctic being held up by ice in the Chuki (sp) sea. Here in the center of South America sub tropics 4C at the moment about -20C off scale it sure the hell is warming up! I am not surprised that it happened. The area of Arctic sea ice has been shrinking at the rate of 11 percent per decade for the last 30 years. The year 2007 was exceptional because poleward winds pushed a lot of warm water through the Bering Strait which then proceeded to melt a huge batch of ice directly north of it. At the same time the Russian side of the ocean remained undisturbed. Claims that global warming caused it were shown to be false when more normal ice conditions returned next year. But the trend I mentioned is still active and I knew that eventually it would reduce the area of Arctic ice to 2007 levels and even lower. That is because the Arctic is warming and has been since the beginning of the twentieth century. Prior to that there was nothing but two thousand years of slow cooling. The warming started suddenly at the turn of the century, paused in mid-century, then resumed, and is still going strong. There was no parallel increase of atmospheric carbon dioxide when the warming began and this rules out the greenhouse effect as a cause. That is because infrared absorbance of carbon dioxide is a physical property of the gas and cannot be changed. If you want it to absorb more to create warming you must increase the amount of gas that is doing the absorbing and this did not happen. Absence of the greenhouse effect also explains why climate models based on it have totally failed to predict the Arctic warming correctly. It is two to four times faster than those models predict. Apparently a rearrangement of the North Atlantic current system at the turn of the century caused the currents to start carrying warm Gulf Stream water into the Arctic Ocean. Direct measurements of current temperature reaching the Arctic in 2010 showed that it exceeded anything measured for the last two thousand years of Arctic history. See E&E 22(8):1069-1083 (2011). On the discussion of the comparisons between PM sensors and NIC products, note that they’re talking about area (I.e., weighted by concentration). There is a well-known bias in PM area estimates due to surface melt and weather. However, this is much less of an effect for extent, which is a simple ice or no-ice threshold. There can sometimes be larger discrepancies in rare cases like this year with the sparse ice regions, but PM and NIC extents generally are pretty close, especially when accounting for the fact that NIC maps all ice. Tony, don’t you ever get tired of all of this? Stuff happens: it’s not happening! How can we know what happened 20 [years, decades, centuries, whatevs] ago to compare with today? It’s happening: but it’s not so bad! In fact, people 20 [years, decades, centuries, whatevs] ago enjoyed the heat! We could do a little something about it: oh noes! We will all suffer an economic fate at least one 20th as bad as the ’08 economic meltdown which occurred because we didn’t do anything about it! And millions of people will die because we feared what the alarmists told us! C’mon; rinse-lather-repeat. Don’t you ever get tired of this nonsense? Just for grins, lets look at this situation the way scientists would have 35 years ago, before climatologists became perpetual government lobbyists mostly interested in trying to secure their grant-dependent paychecks (and when I was in graduate school). We have now a way to measure ice extent (NSIDC) that goes back a number of years, and for the last several years there is also a new and different way to measure ice extent (MASIE). The two methods disagree to the tune of around 0.6/4.1 or 0.6/4.7 — depending on what is chosen for the denominator — say, approximately, 13% to 15%. This is great, because now we can go back to all the past NSIDC measurements and put 13% to 15% error bars on them. Not only that, we can compare the MASIE and NSIDC measurements over the last few years and see whether their difference is mostly random, mostly constant (which suggests bias) or somewhere in between. Well, for starters, because there aren’t any “Eskimo”–it’s a misnomer not used by the folks it is supposed to describe. The NSIDC methodology seemed good enough for the http://wattsupwiththat.com/2012/06/01/sea-ice-news-volume-3-number-6-sea-ice-outlook-forecasting-contest-for-2012-is-online/ with the “4.9 million square kilometers” for the ARCUS submission. The Japan Aerospace Exploration Agency (JAXA) has released some observation images on the Earth acquired by the Global Change Observation Mission 1st – Water “SHIZUKU” (GCOM-W1). The SHIZUKU was launched from the Tanegashima Space Center at 1:39 a.m. on May 18, 2012 (Japan Standard Time) and entered into the A-train orbit on June 29, then has started regular observations since July 3, after increasing the antenna rotation of the onboard Advanced Microwave Scanning Radiometer 2 (AMSR2) to 40 rpm. Figure 1 is a one-full-day observation image of the Earth by the AMSR2 aboard the SHIZUKU from 9:00 a.m. on July 3 (JST) to July 4. In this image, whitish-yellow color parts indicate areas with heavy rain or sea ice, light blue color areas are with little water vapor in the atmosphere or thin clouds, the dark blue color sections are areas with more water vapor in the atmosphere or thicker clouds, and the black color parts are areas that were not observed. The melting is great news, scientifically. This is the first time so much melts since we’ve had satellites to measure ice. So this means a wealth of interesting data to study in the years to come. And what would you do about it? Erect tons of wind turbines and PV modules like we here in Germany and produce one percent of our primary energy consumption via these contraptions and feel very smug indeed about it? While spending 0.5% of our GDP in subsidies on all of this activity. You think that’ll make a difference? Come on. Only a near-complete shutdown of all civilization would make a substantial difference to CO2 emissions. Say, 80% reduction in energy consumption. Let’s talk some real numbers here. You think that’ll have only a minor impact? In that case, I can only recommend you get better medication. But we know what you really want, don’t we? You’d like to get your teeth into that half a percent of GDP in subsidies, who wouldn’t, and in return assure society that now everything is very fine and just on the right track indeed. We have many such crooks in my country, and they’re very successful. “There was less arctic ice for a period of over 400 years when the vikings were farming Greenland. Greenland, especially southern Greenland where the farming Vikings were, is not part of the Arctic Ocean where the floating ice (or lack thereof) being discussed in this post is located. I don’t recall reading anything about floating Arctic Ocean ice during the Vikings-farming-Greenland period. I would greatly appreciate a link. Tez, you must be a long-lived alien for I’m fairly certain none of the rest of us expect to be around to share your concern in 400 years. I never understand the warmists. On the one side they say they are alarmed by the “catastrophic” global warming, but at the other side they are happy that the polar ice is melting. Now, what do those guys really want: warming or cooling? RTFM! The primary thesis of the article makes no sense because you cannot compare the NSIDC extent numbers that are based on a 15% or greater ice concentration with the MASIE extent numbers because they are based on a 0% or greater ice concentration. 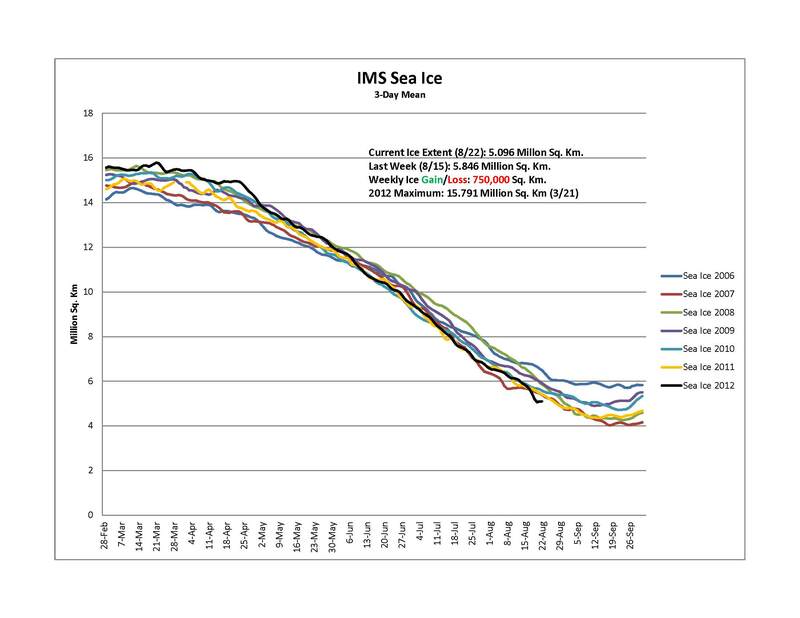 You can find the documentation for NSIDC here: http://nsidc.org/cryosphere/quickfacts/seaice.html. I tried finding a good definition for the IMS extent numbers, but I could not find that. If someone does find it, please post. The extent numbers that include all ice down to a concentration of 0% will naturally be larger, so the differences in the data make sense. And the differences in their purpose also makes sense. So if you are navigating in arctic ice and want to avoid a Titanic event, you should use the 0% extent numbers, as that will help you avoid outlier chunks of ice. But if you are trying to represent the total amount of ice coverage, you should not let your numbers be distorted by outlier chunks of ice that could be many miles out in open ocean. Scientists have settled on the 15% number for this purpose, so the NSIDC values are appropriate. NSIDC’s numbers are also appropriate because they strive to provide a consistent method of measuring the ice over the entire 1979 to present period. Jean, Mann’s mood is not described by any witness. It is interpreted by Anthony. Regarding the fascination with sea-ice for warmists, it’s a two-edged sword. On the one hand it is an indication – observable evidence – of what they fear and lament. It bothers them. On the other hand, it is, for them, an easily observable, fast-moving metric that may wake the populace to the anti-CO2 emissions cause. It is also a thumb in the eye to skeptics that have been promising that 2007 was the year that would begin to see sea-ice rebounding back to previous levels; that recovery is nigh. And I think for them there is a kind of morbid fascination with watching a train wreck in slow motion. Certainly for myself, the idea that I could see a North Pole free of ice within my lifetime – well, I’d be dead if it didn’t energise me in some way. This is an event that won’t have occurred in the history of human civilization, and perhaps not for millions of years, and it is on a grand scale. Rarer than a blue moon, and as big as a continent: the decline portends an awesome event, regardless of belief or otherwise in AGW. Seems to me that IMS and MASIE (paired but different) are outliers in a general swathe of indices recording record melt already. And I believe IMS is still at the record low for this time of year, if not the total record. The institutes in this list are looking specifically at long-term sea ice behaviour and are trying to refine their estimates to that end. NIC outlook and methods are not designed for that purpose. If Walt thinks 0.4m KM is a “slight difference” then he should not have a job in a scientific discipline. The question would have been what would MASIE have shown in 2007, presumably that would have estimated high also. I don’t see too much of a problem with continuing to use the passive microwave system they have as long as it is consistent from year to year. All these ways are not 100% of course. Ideally it would be nicer for the passive microwave to show a better more accurate result in summer though as summer is where all the action is. If concentration is less than 15% then is that actually an ice field? Where is the dividing line between the ice edge and the sea which is full of icebergs? I guess that is open to debate. Seems you should follow your own advice. Read The Facts, Moron! The info on the IMS numbers is found about halfway down the MASIE documentation page, which you should have noticed if you had actually read it. It’s the section titled “General Derivation of IMS Sea Ice Coverage at NIC”. The IMS product is mostly manually generated by an analyst looking at all available satellite imagery, at output from a satellite passive microwave ice mapping algorithm, and at other ancillary data. The analyst begins with a map from the previous day as a first guess. Input satellite data and fields are sampled to a standard 6144 km x 6144 km (~4 km per pixel) matrix. 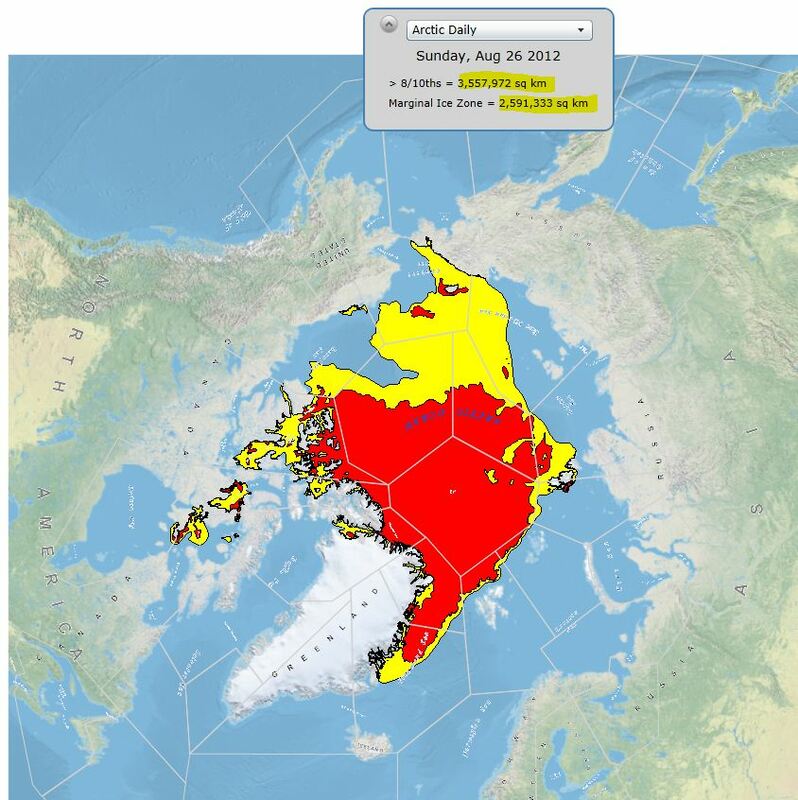 The analysts integrate all data sources for the best estimate of areal coverage of ice cover. A cell is considered ice covered if more than 40 percent of the 4 km cell is covered with ice. This is regardless of the ice thickness or ice type. The 4 km product is automatically saved in ASCII, GeoTIFF, and GIF formats. Got that? 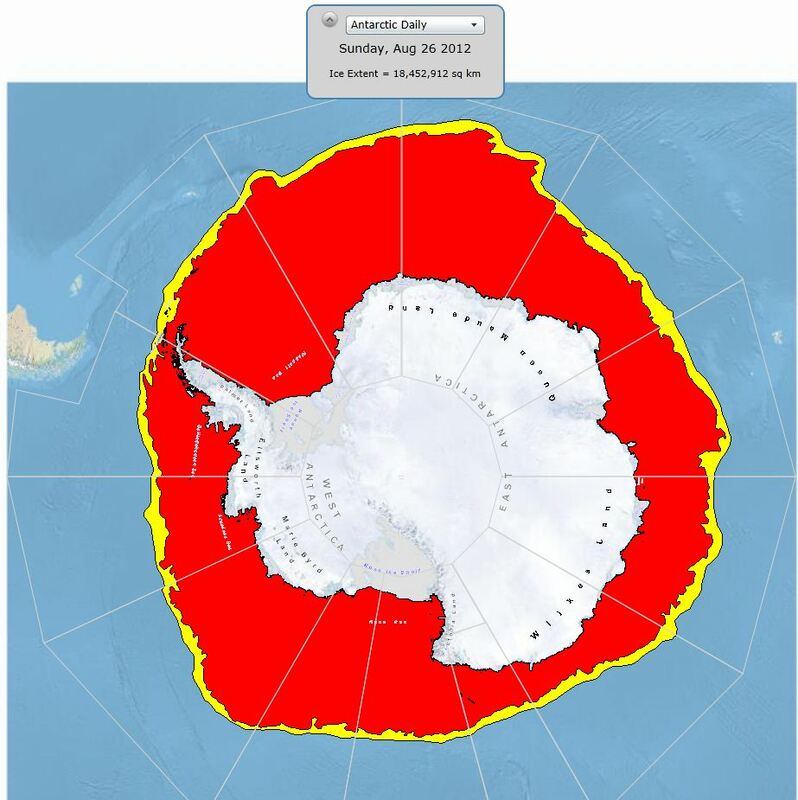 IMS marks off 4km cells as ice or no ice, using 40% coverage. IMS goes into MASIE. So while you whine about how MASIE extent numbers “are based on a 0% or greater ice concentration” you’re just showing off your ignorance. How can you get 40% coverage from 0% concentration? My tuppence ha’penny worth, Pocket OED:1925, Petitio principii, begging of the question, from the Latin, begging of the principle! A classic example is as said previously, upon the discovery of the so called “hole” in the Ozone Layer, “how do you know it hasn’t always been there?” An important question so far unanswered in 50 years! Current data suggests this is a regular oscillating occurrence. Then again awkward questions of detail are best swept under the carpet, better to creat panic & fear instead, sarc off! What is / are the cause(s) of the low extents since 1979? And please let me know what the minimum extents were between 1800 to 1975? This paper from Ribeiro et al does so. Presently, the Baffin Bay southern sea-ice boundary extends from Disko Island to the southwest, towards Canada. This would imply that prior to AD 1250 this boundary was more northerly and gradually moved towards the vicinity of the core site until after AD 1500 (Little Ice Age), when it was positioned south of the core site. Hooray I hate ice and cold, sooner its gone the better. A cell is considered ice covered if more than 40 percent of the 4 km cell is covered with ice. The 40 percent threshold on ice demarcation for the IMS product is not directly related to 40 percent ice coverage estimated from derived passive microwave sources. At a 4 km2 resolution, several IMS cells fit within each coarser passive microwave derived sea ice concentration cell that are 12.5 km2 or greater. These IMS cells can reflect a mixture of areas with and without ice. Furthermore, the use of visible and SAR imagery during summer melt seasons means that IMS product accuracy does not degrade as much as does the accuracy of products based solely on passive microwave data, when surface melt water attenuates the passive microwave signal. This microwave attenuation leads to underestimates of the ice concentrations, particularly along the marginal ice zone during the summer. Yeeeahh… just wake me up when subs surface. The NSIDC Arctic Ice Extent graph at the top of this post normally has error bars for the 1979-2000 average included on the graph. For some reason Mr. Watts prefers to remove the error bars when he shows the graph in WUWT. The first thing that everyone working in science understands is that we need comparable data. Really, it’s not a good idea to suddening change the method of collecting/calculating data after about 30 years. If the NSID did this, not doubt that scientists and skeptics alike would be up in arms complaining. The BBC ran this yesterday and interviewed some Oxford ‘expert.’ He claimed that ‘they’ had forecast this for years. He also predicted zero ice in summer at sometime in the future. Where have we heard this before? However, there was no mention of differences between the various survey methods. You’re kidding, right? Did you really expect to get away with that claim? You’ve selected the version with the error bars added by NSIDC. You have falsely accused Anthony Watts of removing error bars that were never there. Surely the main point here is not the absolute quantity of ice but the change over time? As long as NSIDC uses the same method of measurement now that it used in 2007 and back to 1979 it is perfectly correct for it to say that NSIDC’s measurement of the extent is at NSIDC’s lowest level since NSIDC started its index. In which case it really does not matter what measure you use provided it is consistently the same. The “absolute” figure is only really important when comparing methodologies (or when determining the end point when the ice has all finally disappeared). For instance it is possible for there to be a record low in extent without there being a record low in area – as that is dependent on how spread out the ice floes are. Trawling the different measurement regimes to try and find a figure that is higher than NSIDC’s and then say “there, I told you the sea ice is not at its lowest extent” is just blatant bad science, statistics and journalism frankly. You are comparing apples with oranges and saying “there, I told you fruit are red not orange”. The NSIDC error bars are only on the BaseLine, where are the error bars for the actual readings. This might be good for the skeptic cause again as the warmists totally exaggerate and are caught out once again re: other graphs and probable increase next year ice extent NH back to normals etc. The whole discussion is actually pointless as global temperatures have NOT increased since 2002 and as you point out Antarctica has been above anomaly most of the time so no correlation whatsoever..
I’d like to know where all this extra energy is supposed to come from, if the energy comes from the sun during summer (which it does) then it would make sense to look at the data from past solar cycles. I understand it as fact that the solar cycles of the late 20th century had a higher sun spot number/activity than this solar cycle (cycle 24, although still in progress), it is blatantly obvious that successive cycles of high sun spot number, larger spots and increased CME activity have an effect on sea ice, remember we are talking about sea ice and not Ice over land which there has been little or no significant change. Any reasonable minded person would first put the sea Ice variability down to the effects of solar activity and energy coming from the sun and interacting with the Earth and try to understand how summer arctic storms break up and disperse the sea ice, or at the very least explore and try to understand this process. Some dishonest people are using a normal summer sea Ice melting season as a springboard to launch a campaign as if sea ice variability supports their view, when in fact it does not support a man made global warming narrative one way or the other, especially in light of the recent solar minimum between 2008 – 2011 when northern hemispheric winters got cooler, more snow cover over land and more rivers freezing up, what was the Sun doing at this time? It is interesting. If the sun has successive cycles of low activity I would expect sea Ice to increase. The cycle of arctic sea Ice variability takes many decades to increase and decrease overall. furthermore, it has only been three decades of monitoring the Sea Ice from space using satellites, I would have thought that anyone who claims to be an intelligent person studying Sea Ice would understand the significance of how insignificant three decades of satellite data of sea ice actually is compared to the much larger timescales earth cycles through and with that the cycle of sea ice variability. I am suffering from AOS. Useful Glossary Of All Acronyms Referred To. I been tracking the Masie data since March when the sea ice maximum occurred (Masie only provides 30 days at a time so I started saving it). Masie mostly tracks the NSIDC until the last 30 days when it diverges quite a bit higher – being as much as 1,000,000 km2 or 22% higher. 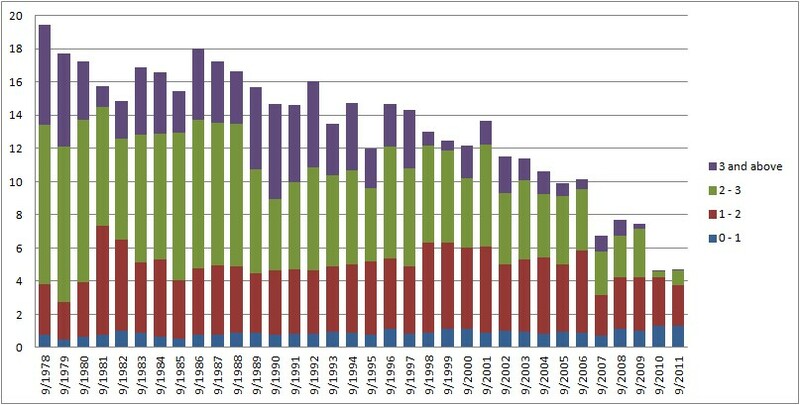 Here is Masie (Green) and the NSIDC (Red) charted for 2012 against all the years in the NSIDC database back to 1979. I use the same 5-day trailing average for both in the chart (moved back two days so it is at the effective right timeperiod). Go to toolbar at top of any WUWT page. Go to “Resources”, click on “Glossary”. If the acronym is not there, you can ask for it with the comment box below. As a scientist Mr. Watts would naturally have chosen the graph with error bars. Wearing his political lobbyist hat he has chosen the graph without error bars, preferring to avoid the possibility that his followers would consider the statistical significance of recent summer extent minima. REPLY: It’s the same plot NSIDC presented to the public in their announcement. If it is good enough for them, good enough for me. With regard to previous sea ice around the arctic, I remember reading a book called 1421 a few years back which told of a huge Chinese fleet which explored the world at that time. Some of the claims are more believable than others but IIRC among them is that a remnant of the fleet sailed up the west and round the north coast of Greenland and managed to produce maps at the same time. Obviously that is not possible today, but appears to have been then, perhaps more evidence of the medieval warm period and, if true, would certainly have allowed farming in southern Greenland. If nothing else it was an interesting read, especially the discovery of America pre-Columbus. Is this possibly a ‘Watts effect’? Control [in a variety of guises]. Today’s Modis satellite pictures have less cloud cover in the western Arctic than there has been for (well, 3 months really). Still cloudy but more can be seen now. It might be a little deceiving, but there is certainly more ice in the western Arctic (although it might not reach the 15% threshold in all cases). There is significant ice cover around Wrangel Island off the Siberian coast (and the scene of the in famous polar bear / walrus battles). Bands 3,6,7 show ice as Red which can be useful to distinguish from the cloud (smoke will also show up in a type of Red so watch for that – it is usually banded red). The grey bar in the NSIDC chart is the standard deviation (x 2), NOT ‘error bars’. A standard deviation shows the spread of data around the mean. Error bars show the range of possibility for an estimate. That NSIDC show 2 standard deviations from the mean is a testament to how much the ice coverage has receded. Right now, the NSIDC 2012 value is 7 or 8 standard deviations away from the 1979 to 2000 average. In purely statistical terms, this is a huge departure. Thanks, Paul. I’m traveling today, but will read it tonight. I wonder what that is about? I agree. There are two different methods of measuring arctic ice coverage. That is a good thing, just as it is good that we have both land stations and satellites to measure air temperature. Microwave indices see more water than ice, while NIC index sees more ice than water in mixed conditions. So they will each have distinct results and trends. Select start year 2006 and month of August. Let’s stop a moment to keep count here. So you’re admitting you have falsely accused Anthony Watts of removing error bars that were never there, right? 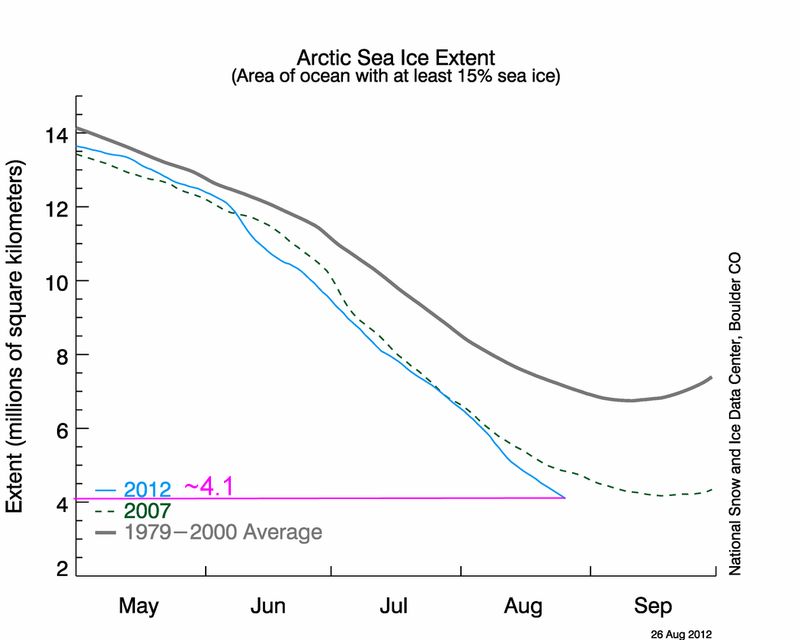 It’s the IARC-JAXA Arctic Sea Ice Extent graph, and they don’t put error bars on their averages! Obviously the graph doesn’t come from scientists, but from political lobbyists! Oh no, what’s this one? It’s the Cryosphere Today Northern Hemisphere Sea Ice Area chart, and they don’t have error bars on the 1979-2008 mean! Dang Cryosphere Today political lobbyists don’t want viewers to consider the statistical significance of recent summer extent minimums! *sigh* Could you get any lamer? Scientists aren’t worrying about them in their presentations, and Anthony long ago showed he’s more of a scientist than you. It’s a non-issue. This is anecdotal, but I overflew the Arctic Ocean many times during the mid-1960s. One year, 1964, I spent about 35 days, from August into early September, flying sorties out of Eielson Air Force Base, Alaska. Back then, there was much more sea ice on the Arctic Ocean than the satellites depict for current times. Of course, back then, there were no satellites monitoring sea ice on the Arctic Ocean. On sorties we flew out toward Novo Sibersk and Severnaya Zemlaya the ocean was covered in sea ice from a few tens of miles off shore from Point Barrow. We could see leads in the pack ice, but it was pretty much solid by the time we got around 100 NM off shore. By the time we flew our last sortie, in early September, the sea ice had noticeably move in toward the shorline at Point Barrow, maybe no more than a mile or two off shore. The day in the first week of September, when we departed Eielson AFB for home, a heavy wet snow was falling. Now, I’m citing all of this from memory, but in that period much or North America was experiencing very cold winters. I am certainly not a believer in human caused global warming, but over seven decades of casual observations, The trend has been from colder winters to, frequently, milder winters. BTW, I am old enough to remember the infamous Blizzard of ’49. It came over the area I lived in as freezing rain severe enough that it downed power lines and broke many, many trees. It was close to a week before power was restored. Back then we kept warm with coal-fired furnaces and burned candles for light. The ice was a long time melting. Over at Sketptical Science Daniel Bailey posted a map of Arctic ice in August of 1938. 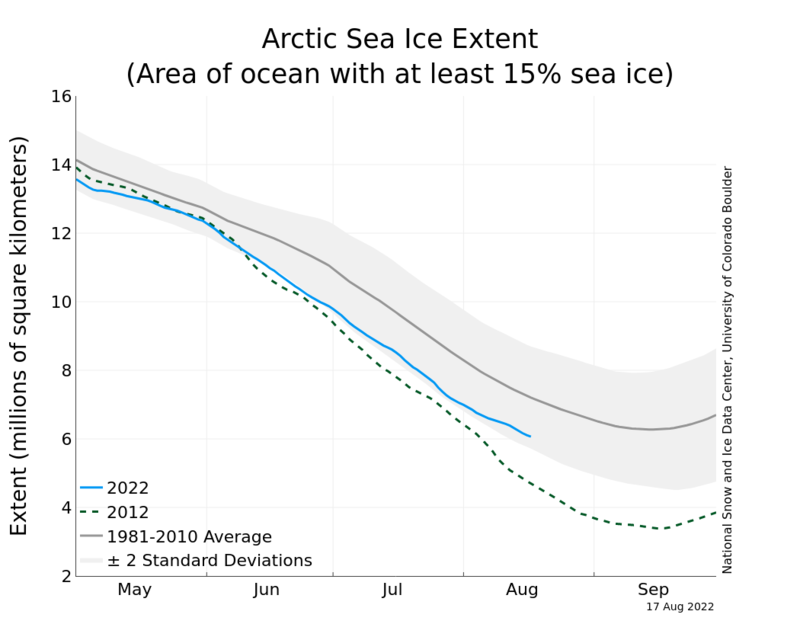 It seems the sea ice extent has been dropping rapidly the last few years. From his souce of the map you can look at sea ice extents for many years and various months. You should have highlighted that someone’s pedantry. Sorry, it means arguing in a circle. For example, if we search the NYT index for recent uses of “beg the question”, we find that out of the first 20 hits, 15 use “beg the question” to mean “raise the question” — and of the five that don’t, four are usage articles berating people for misusing the phrase! But for me, all this raises a more important question. You see, for all the people I’ve heard bemoaning others’ misuse of “beg the question,” I’ve never actually heard someone misuse it. So all the friends who told me I should do a column on “begs the question” because the term is so widely misused — well, it looks like those people were begging the beg-the-question question. In other words, nobody (or hardly anyone) uses the term to mean “assuming the conclusion”. This is probably because of the terrible, awkward, and outdated translation of this meaning into English. My advice to you is to let it go. The new meaning is well understood by everyone – even you. You only cause confusion and problems when you comment on it. 1. English usage changes. “Liberal” no longer means what the Founding Fathers meant when they used the word; quite the opposite now. Similarly, logicians are in the process of losing control of “begs the question” and it now means, as well, “raises the question,” as someone has pointed out. Usage determines meaning in English, because it is an actively-used, evolving, language. Dictionaries are always getting bigger, not smaller. “Mouse,” for example, has an added meaning since I was a child, and “progressive” is in the process of undergoing the same corruption of meaning as “liberal” once did. 2. The original terminology in logic was always confusing anyway, thereby increasing the odds that it would be taken over as another usage at some point. Logicians would be well advised to relinquish “begs the question” to its new usage and devise with a more self-explanatory, self-evident, terminology. I’m no logician, by a long shot, but to me “begging the question” tends to mean “assuming the argument,” i.e., assuming a point as true, and then using that very point to argue the same point is true. Obviously, this usually takes some disguising of the point as it is being put forward as an assumption. Otherwise it becomes too obvious, e.g., “You’re stupid because you’re dumb.” But if the point is better disguised, e.g., “You’re stupid; you’re incapable of understanding my argument,” then you might just get away with it, without any need to present actual evidence to support your case, especially if you make that statement from a position of authority. Yet, in both cases, you’d have assumed as true the very argument you’re trying to make. This begs the question, will logicians continue to fight a losing battle? P.S. I fully expect to be called out on my interpretation of the points of logic above. As for the war over “begs the question” though, that one’s been decisively lost, and will remain lost, especially given the wholesale abandonment of a traditional “liberal” education by most of our institutions of higher learning. You are using this product in a way specifically called out by NSIDC as incorrect and fallible. Nice to hear a different perspective on the ice melt. I would think the ice melting is a good result and should open new commercial shipping routes and allow oil, gas, and mineral extraction from the sea floor. And I can show maps from 1600 showing open water. Doesn’t mean it’s accurate. G.P. Hanner at 8:16 , good memory , the Columbia river froze over in the winter of 1949 . My wifes grandfather remembers it well as he was working in building construction by the river at that time and recalls it was some of the most miserable working conditions you can imagine. This occurred at Portland , Oregon . Error bars are a graphical representation of the variability of data and are used on graphs to indicate the error, or uncertainty in a reported measurement. They give a general idea of how accurate a measurement is, or conversely, how far from the reported value the true (error free) value might be. Error bars often represent one standard deviation of uncertainty, one standard error, or a certain confidence interval (e.g., a 95% interval). These quantities are not the same and so the measure selected should be stated explicitly in the graph or supporting text. I’m trying to figure out exactly what they are showing. Two standard deviations is 95%, they’re working with daily measurements (smoothed with a 5-day trailing average), it looks like they’re showing the range that 95% of that day’s measurements fall in. But the reported measurements have an amount of uncertainty to them. Is that worked into those bars as well? Rule number one: never, ever – ever admit. I cheer for the WUWT community’s heroic effort at battling the truth. Am looking forward to the spectacular “recovery” of 2013. “Ask an Inuk”, please, or ‘one of the Inuit’ (the collective noun). You could also ask one of the Yupik or Aleuts. “Eskimo” (people who speak a different language) is considered by many to be an epithet. If it was not quite clear above, the term “Eskimo” means, “people who speak a different language”. It does not mean, “eaters of raw meat.” It also makes no sense to use it as a name for several groups of people as most people ‘speak a different language’ from our own. 1. Do you understand that the Arctic regularly goes through these cycles? 2. What is the problem, exactly, with ice fluctuations? So what? Arctic sea ice cycles happen routinely. Arctic ice levels have been half what they are today during the Holocene – when CO2 was very low. You can not produce one iota of scientific evidence showing that human CO2 emissions have anything to do with Arctic ice levels. Because there is no such scientific evidence. Without evidence, your opinions are based entirely on true belief, not science. Think about what you’re trying to sell here. There is no difference between your baseless belief that receding Arctic sea ice is bad, and a belief in the village witch doctor’s juju. Neither belief is based on science. I have a question / contemplation about Arctic sea ice. I was wondering if the big cyclonic storm from earlier this year, is actually a mechanism in thickening the ice pack in future years? My thinking is that if the ice is pushed and piled up together, perhaps much of the volume of that ice that was covering more surface area, is now stacked up vertically, in a smaller surface area. When winter comes, this thicker body of ice will consolidate and freeze together, and some of that ice that was exposed to melting will now be protected from melting by more depth. If such storms, while they do open more water in the short run, in fact thicken a large area of ice that will survive in the long run, then this would provide another mechanism for a cyclical long term variation of ice coverage. If the whole ocean is covered, no matter how cold, the ice doesn’t thicken as much as a good storm that piles large volumes of ice into a vertical configuration. Does this sound reasonable? Are there any studies that examine this question? So when there is a number of measurement available, the one chosen is that which gives the most alarming results, not that which is likely to be the most robust. A bit like using the latest version GISSTEMP to measure the global average temperature change. For the ice volume simulations shown here, sea ice concentration information from the NSIDC near-real time product are assimilated into the model to improve ice thickness estimates and SST data from the NCEP/NCAR Reanalysis are assimilated in the ice-free areas. 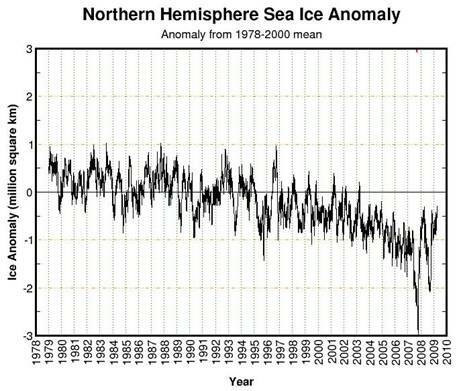 So PIOMAS uses data that is stated as ‘not fit for purpose’, that is incorporated into the PIOMAS model’s “sea ice volume anomaly” results, presented as a time series, with trend analysis. Yet alarmists everywhere are quite happy to report the PIOMAS figures as accurate and fully scientific. Really, you have to figure out what NSIDC product is suitable for analyzing extent (or area) trends. NSIDC says to not use their daily Sea Ice Index numbers, use monthly. And even then, there are caveats. All Sea Ice Index images and data are derived from daily or monthly gridded sea ice concentration that come from two sources: The Near-Real-Time DMSP SSM/I-SSMIS Daily Polar Gridded Sea Ice Concentrations (NRTSI product) data created at and distributed from NSIDC with data set ID NSIDC-0081 and the Sea Ice Concentrations from Nimbus-7 SMMR and DMSP SSM/I-SSMIS Passive Microwave Data (GSFC product) created at the Goddard Space Flight Center (GSFC) and distributed from NSIDC with data set ID NSIDC-0051. The NRTSI product is available at a daily temporal resolution, and the GSFC product is available at a daily and monthly resolution. Elsewhere it is mentioned that NRTSI numbers are replaced with GSFC numbers. So don’t try to infer much of anything from the daily Sea Ice Index numbers as there’s too much uncertainty. (Heck, you have to wait several days after they come out for them to be “set”.) Monthly is better for just about anything. But in either case, you might have to wait until the numbers are more than 18 months old to say anything definitive, as the Goddard numbers are the final say. Maybe quite a bit longer, the NH daily GSFC-only final file (versus the NRTSI-only “provisional” file) ends on the last day of 2010, nearly 21 months ago. But what if you needed the most accurate reliable info on the sea ice now? Like if you wanted to a quick spot check on a report of tremendously low ice? You’d use MASIE. There´s a lot of talk right now about the warming of the Arctic. Read this article from November 1922 by George Nicolas Ifft about “The changing Arctic”. It´s happened before! It’s a sad day for science when you have to use an outlier year data set to support your theory. Please note 2012 ice coverage in February and March according to the graph was in the highest range of the IMS Sea Ice 3 day mean display. So shall we talk out of both sides of our mouths and say the 2012 winter ice proves the on set of global cooling and then 6 months later claim the 2012 summer data proves AGW? I think this is demonstrates why weather is not climate. Global Warmers need to grow up and start taking responsibility like adults IF they want to be treated as serious scientists instead of rank amateur activists peddling ignorant folk tales. This is such an annoying debate. A) Arctic sea ice melting tends to support the view that the Earth has warmed, but it says nothing about attribution. B) Antarctic sea ice is trending upward, so focusing on loss of ice in the Arctic is cherry-picking, cultural bias by the NH hegemons. C) We have only 33 years of accurate data, hardly enough to divine long term trends. D) Anecdotal evidence suggests arctic sea ice has been lower in the past, even the fairly recent past. Of course, the warmists claim that decreasing arctic ice and increasing antarctic ice is just what their hypotheses project, but it’s just ex-post-facto, Texas sharpshooter style spin. All this is, is a “gotcha’ moment”, a propaganda tool to frighten lay people with a visual they can easily grasp. It means nothing at all beyond that. Wow, practically three times the loss from 8/26 to 8/27 as from 8/25 to 8/26. The loss is accelerating! How alarming! This is pure speculation, since I have no evidence. I am guessing that (based upon responses I have seen) that there is an ongoing tug-of-war between the Navy guys (NIC used to mean Naval Ice Center) and the NASA satellite guys with the new-fangled microwave sensors and algorithms. When you hear that “operational indices” are less good, it is a put down of the Navy guys by the the Space guys. When you hear that the algorithms underestimate the actual ice, it is the Navy guys striking back. WUWT is one of two blogs I read to start every day here in the antipodes (sic). From the discussion thread above and to quote “I decided to no longer use the phrase because it is so widely ‘misused’ ” sums up the issue quite neatly in terms of English usage. Unlike basic mathematical formulae languages evolve. If it didn’t then there would be a lot more f’s in the language than p’s. While there is some historical value in pointing out how a phrase may have been used, or what it meant it is currently accepted usage and meaning that defines what is says today. Asking your grandmother what “being gay” meant in her day will give a difefrent answer than asking someone a lot younger. The phrase may be ‘misused’ through a historical lens but for most the ‘new’ meaning is clear . Warming of course so they can continue to collect their nice fat checks. Where is your scientific evidence that sea ice extent is natural? Show me your science please? I have asked you several times now, but why are you refusing to show it to us. Apparently we are missing something. Why do you still keep providing the same link you also used in a previous blog that says nothing, absolutely nothing, about current sea ice conditions to be a natural phenomenon not caused by man or by the same conditions which were there 6000-7000 years ago? Do you even know why there was less sea ice 6000-7000 years ago? ….. For instance it is possible for there to be a record low in extent without there being a record low in area – as that is dependent on how spread out the ice floes are. Actually that brings up a very interesting point. On the other hand there is very good chance all that ice is still there but is now at less than 15% concentration because the storm churned the seas like an eggbeater and flung the ice all around the “bowl” of the arctic sea. The ice is still there but spread out so it is at less than 15% concentration and therefore not counted. That means the number reported is nothing but an artifact of the counting method coupled with a nasty storm. What will be interesting is what all these far flung chunks of ice will do to the upcoming winter freeze. The Mean Temperature above 80°N has already fallen below 0°C. 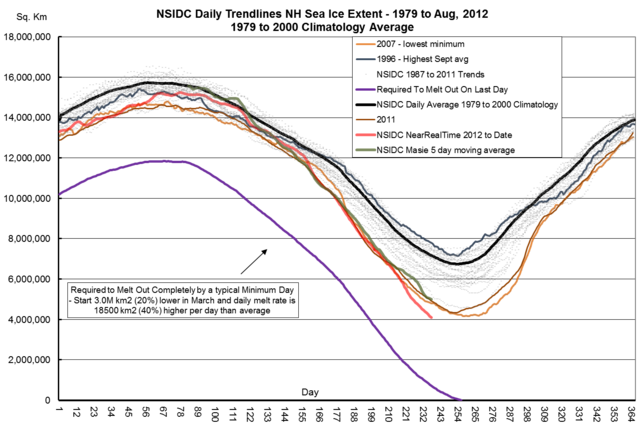 NSIDC does not have error bars on the time series plot shown in the “Daily Image Update” and the daily time series plot (usually labeled “Figure 2”) because we strive to keep the images concise and easy to read. Plus, the error bars would be quite small compared to the total extent values in the images…. For average relative error, or error relative to other years, the error is approximately 20,000 to 30,000 square kilometers (7,700 to 11,600 square miles), a small fraction of the total existing sea ice. For average absolute error, or the amount of ice that the sensor measures compared to actual ice on the ground, the error is approximately 50 thousand to 1 million square kilometers (19,300 to 386,100 square miles), varying over the year. During summer melt and freeze-up in the fall, the extent may be underestimated by 1 million square miles; during mid and late winter before melt starts, the error will be on the low end of the estimates. It is important to note that while the magnitude of the error varies through the year, it is consistent year-to-yea. This gives scientists high confidence in interannual trends at a given time of year. The gray area around 1979 to 2000 average line shows the two standard deviation range of the data, which serves as an estimate of the expected range of natural variability. Scientists use standard deviations as a way to estimate the range of variability of data. In the context of climate data like sea ice extent, it provides a sense of the range of expected conditions. For the 1979 to 2000 mean, the error bars would be the relative error of 20,000 to 30,000 sq/km. The 2 standard deviations shown is about 2 million sq/km at September minimum. It is clear that neither logic nor data will convince you of anything. But for the sake of readers who may be misled by your post, let me state once again: scientific skeptics have nothing to prove. The “carbon” conjecture is not ours, it is yours. You still believe that CO2 is the cause of runaway global warming, despite not having any supporting evidence or runaway global warming to point to [or any global warming for that matter over the past decade and a half, despite a large increase in CO2]. I have repeatedly provided solid scientific evidence showing conclusively that CO2 rises as a function of temperature. CO2 does not cause any net temperature rise. The planet is still warming from the Little Ice Age, causing CO2 to outgas from the oceans just like it outgases from a warming beer. You have cause and effect reversed. Rising CO2 is the effect, not the cause of global warming. And my evidence that sea ice is in a natural cycle is based on the null hypothesis, which has never been falsified. Note that the null hypothesis is a corollary of the scientific method. Even Kevin Trenberth admits he does not know the causes of climate change, so go argue with him about it. Trenberth wrote in the Climategate emails: “We don’t understand cloud feedbacks. But I am glad to see you admit that there was less Arctic sea ice in the past than now. That Arctic ice decline occurred when CO2 levels were much lower than currently, thus deconstructing the evidence-free belief that CO2 causes global warming. I wish this new measurement tool was around 30 years ago, so we could compare the data now to the data then using the same tool. I wonder if it would show, using this method, that the current sea ice is the lowest recorded. You state that “At 82.3N, the northernmost reported Canadian weather station shows a daytime high of -1C today, so it looks like the melting season has ended there”. You fail to take into account that at 82N there is still significant solar insolation in the month of August. See for example http://pubs.aina.ucalgary.ca/arctic/Arctic49-2-170.pdf. Therefore, the air temperature may be below freezing, but the open water near the remaining ice fields will be heated above freezing by the absorbed solar radiation. Let us see what the final numbers on ice extent before drawing any conclusions. I agree with one of the posters above that the appears to lack objectivity with his most recent criticisms of the sea ice extent “numbers” from the NSIDC. I note that the measurements from every source on the sea ice extent reference page are clearly equal to or below record low levels. Certainly, the storm in early August contributed to the low levels. However, this is unlikely to be the only reason in light of the accelerated melt we have seen in the past 3 weeks of August. The marginal zone in that one depiction is huge. Frighteningly huge. IMS is currently showing lowest extent for this time of year. I think from this plot of regional sea ice it can be gleaned that the MASIE product is showing the lowest sea ice coverage for this time of year. 2012 shows as a flat line at the bottom of some of the graphs where there is no sea ice in that region. The numbers would be better, but I’m having difficulty unearthing a long-term data stream I can directly plot in Exel. But as MASIE data stream seems to begin in 2008 (at best), it’s not a good metric to discern whether records may be broken, not to mention it is not quality controlled for year-to-year comparison (but good for day to day). I think it’s safe to say that every sea ice data set for the Northern Hemisphere is showing a record for this time of year, and most of them are showing outright record daily minimum. Of course, record-breakers are only indications. What really matters is the long-term trend. So Meier has pretty much totally trashed MASIE. So why the heck do they even bother with it? And the True Believer warmists are blaming man-made global warming for that cyclone itself, just like they have blamed man-made co2 for each and every weather event this spring and summer. The latest MASIE (Aug. 27) is down to 4.5 million. This just in –Mark Serreze *still* wrong. kadaka (KD Knoebel), Thank you for the reference. Using the Acronym finders on line sometimes produces amusing results thanks to the predilection of other disciplines for generating their own jargon. 1. What do you think happens to CO2 which comes from fossil fuel burning? 2. Despite your assertion that increased CO2 comes from ‘outgassing’, the oceans have actually become slightly more acidic – because they have become net CO2 absorbers over the past few decades. 3. Following the last ice age, there was a ~100 ppm rise in CO2 which took thousands of years to fully realise. The rise was in response to a temperature change of around 6 deg C. Since ~1900 CO2 has increased by ~100 ppm – supposedly (according to you) in response to a temp increase of just 0.8 deg C. This CO2 rise has taken just 100 years. In 1982 CO2 levels were ~341 ppm; In 2011 they were ~391 ppm, so the rise the rise in the last 30 years alone has been ~50 ppm. As somebody else has mentioned, the Arctic sea is still absorbing a lot of sunlight so even though the air is below freezing in some areas, it is not everywhere in the Arctic and the sea may not be below zero, particularly at mid and lower Arctic latitudes. At 78 degrees north (mid Arctic) the sea is still seeing 19 hours of sunshine. Every year the total area and extent of sea ice continues to reduce well into September even though “average” Arctic air temperatures may be as low as -8c to -10c. I have no scientific basis for the following, other than past observations of ice melting in a tub of water, but it seems to me that breaking up ice and spreading it around a larger area of water will tend to increase the rate of melt? The more fragmented the ice the greater the surface area of ice that is exposed to water. Smaller ice cubes melt quicker than larger ones. Where has the ice gone? I conjecture that it has been blown out into the open sea by the storm where a larger proportion of it than in past years has melted – but we shall see when the sea ice grows again as it will tend to start forming around existing bergs. I would count myself as a AGW “sceptic” simply because I distrust models and prefer evidence from the real world. I am fully willing to accept that evidence when it is clear and unambiguous. To me it is abundantly clear from many sources that we are seeing a very rapid loss of sea ice consistently for all the years we have records. Whether this is part of a natural cycle or caused by anthropogenic global warming is still open to some argument, but the longer it goes on the less likely the “natural cycle” theory – particularly if it continues even after the AMO moves into a cold phase. However this sea ice melt is fully consistent with predictions resulting from the AGW hypothesis. The “warmists” are definitely winning this one! Deniers are definitely on defensive here. If I were one I would stop posting on this, undertake a tactical retreat and only return if the evidence starts to point in my favour again! When one reads this entire thread it becomes quite apparent that a similar argument occrued Thousands of years when a group of persons decided that the sun would keep going down after December 20 or there abouts never to return. One side of the argument was that the failure of men to live a good moral life was causing the gods to be displeased (please deposit donation to appease said gods). The otherside said that it is pointless and unreasonable to suggest that some unknown force created out of fear in anthropromorphic form could possibly be requesting donations that merely lined the pockets of the moralists in ashen cloak. The argument became so heated that one side or the other drug a bunch of really big stones to a place in Southwest England and built an observatory to track whether or no the sun would actually return. After a great deal of arguing, hand waiving, gesturing, fighting and perhaps a little human or animal sacrifice, they figured out there was more or less a cycle and not a straight line pointing to their impending doom. Once the donations fell off, the moralists looked for another means of shearing the sheep. The rationalists were left there penniless having disporoved more or less the moralists original assertions, but not having understood that there never really was an argument about whether the sun would go up or down. In the end it was just a confidence game intended to steal from the easily swayed. Sheep will always find a new master. I would like to thank Walt Meier for his professional, timely and courteous responses on this thread. You are worried sick over the fact that CO2 is slightly higher recently. However, looking at the bigger picture, we see that CO2 levels are about as low as they have ever been. You ask what happens to CO2 produced by fossil fuel burning. The answer is that it becomes part of the carbon cycle. The biosphere greatly benefits from the added CO2. And there is no evidence of any global harm resulting. Therefore, more CO2 is harmless and beneficial. Next, you assert that “the oceans have actually become slightly more acidic”, without any testable, verifiable scientific evidence that this is true. Thus, the oceans becoming ‘acidic’ is only your personal belief. Several previous WUWT articles and comments show conclusively that “ocean acidification” has no credible supporting evidence. But beliefs are comfortable, so you don’t really need verifiable evidence. The rest of us do. You probably don’t realize it, but your statement supports the evidence that CO2 levels rise as a function of temperature. Sorry to see you shoot yourself in the foot like that. Can you comment on what those sources tell us today? Oh, look! Another Hockey-stick graph….who would believe it? He didn’t trash it, just pointed out that MASIE and the NSIDC Sea Ice Index are separate things for separate purposes. It’s like the difference between a flashlight and headlights. If you’re walking around outdoors at night, you use a flashlight to identify what’s there. If hurtling down the highway in your car and you need to know what might be ahead, you use headlights. Sure, what looked like it might be a possum in the road can turn out to be an old shopping bag, but you need to know something is there while driving, thus headlights. When casually walking around, use the flashlight and know for sure what it is. MASIE is a fine resolution operational-type product, suitable for more-urgent tasks like keeping your boat away from sea ice. False positives aren’t an issue as you’re avoiding hitting ice. The SII is for careful thoughtful results when the speed of obtaining results is less important than the definitive accuracy of them. Headlights versus flashlights. That said, one doesn’t need a flashlight to verify a freaking tree fell onto the road. For such a dramatic loss with such a record low, MASIE should have picked it up just fine. As explained in the post above, and again in the thread, those indices are reasonably accurate to measure winter ice extent–for the melt season, not so much. Really, according to ice core data they’re the highest for the last half million years! In fact the evidence is that the last time that the that CO2 levels were this high was 15 million years ago. At that time the geography of Earth was different: no Panama canal and hence much different ocean circulation patterns. Well in that case here’s some. Unfortunately Smokey it’s you who has shot yourself in the foot, since as Finn pointed out a ~100ppm requires a sea surface temperature rise of ~6ºC. For this to have occurred over the last century would have required about 8X the observed temperature rise which I take it you are not claiming? Note that this is consistent with the citation above, i.e. the temperature required to give the present level of CO2 would eliminate the Arctic sea ice! Phil. is clearly fixated on my comments. That’s what happens when you exist in your own bubble of belief in manmade runaway global warming. BFD. Look at the chart I posted for the big picture. The biosphere teemed with life when CO2 levels were high. Phil provides zero evidence showing any global harm due to the added CO2. Therefore, his frantic arm-waving and wild-eyed alarmism has no supporting evidence. It is just his belief, nothing more. Phil also seems to believe that the Panama Canal lowers CO2 levels! Which would provide an easy way to correct high CO2 — if more CO2 was any kind of problem. But it is not, except to those trapped in their CO2=CAGW belief bubble. Finally, Phil still cannot understand that if CO2 rises after temperature rises, then CO2 is an effect of temperature. Rising temperature causes rising CO2, but people living in a CO2=CAGW belief bubble cannot seem to understand that basic fact. The chart Phil posted shows conclusively that even on very long time scales, temperature leads CO2. Should be ‘Panama Isthmus’ of course. “Before the present-day isthmus was created, water covered the area where Panama is today. A significant body of water (referred to as the Central American Seaway) separated the continents of North and South America, allowing the waters of the Pacific and Atlantic Oceans to mix freely. Beneath the surface, two plates of the Earth’s crust were slowly colliding, forcing the Pacific Plate to slide under the Caribbean Plate. The pressure and heat caused by this collision led to the formation of underwater volcanoes, some of which grew large enough to form islands as early as 15 million years ago. Meanwhile, movement of the two tectonic plates was also pushing up the sea floor, eventually forcing some areas above sea level. Over time, massive amounts of sediment (sand, soil, and mud) from North and South America filled the gaps between the newly forming islands. Over millions of years, the sediment deposits added to the islands until the gaps were completely filled. By about 3 million years ago, an isthmus had formed between North and South America. Scientists believe the formation of the Isthmus of Panama is one of the most important geologic events in the last 60 million years. Even though only a small sliver of land relative to the sizes of continents, the Isthmus of Panama had an enormous impact on Earth’s climate and its environment. By shutting down the flow of water between the two oceans, the land bridge re-routed ocean currents in both the Atlantic and Pacific Oceans. Atlantic currents were forced northward, and eventually settled into a new current pattern that we call the Gulf Stream today. With warm Caribbean waters flowing toward the northeast Atlantic, the climate of northwestern Europe grew warmer. (Winters there would be as much as 10 °C colder without the transport of heat from the Gulf Stream.) The Atlantic, no longer mingling with the Pacific, grew saltier. Each of these changes helped establish the global ocean circulation pattern in place today. In short, the Isthmus of Panama directly and indirectly influenced ocean and atmospheric circulation patterns, which regulated patterns of rainfall, which in turn sculpted landscapes. Did you read the correction to the typo? I’m not worried about anything. I’m disputing your claim that the recent increase in atmospheric CO2 is the result of the less than 1 deg C rise in temperatures since 1900. As you haven’t specifically addressed this or any other point I’ll assume you have nothing to support your assertion. Simply repeating the fact that CO2 follows temperature won’t do. We have a pretty good understanding of the processes involved and the rise in CO2 since, say, 1980 cannot in any way be explained by the increase in SST. I note Phil (August 29, 2012 at 11:17 am) has responded fully to the rest of your comments. On the points under discussion there are many, many responsible “sceptics” who don’t agree with you but don’t necessarily think that “runaway global warming” is likely. You don’t seem to understand the processes by which rising temperatures cause increases in CO2. You certainly seem not to understand that a 1 deg rise in temperature is NOT going to result in a 100ppm rise in CO2. To get a 100ppm CO2 rise requires a temperature increase of several degrees and several hundreds – if not thousands – of years so that CO2 can be ‘dug out’ from the deep ocean. No ice at 81N 160W in the NSIDC sea ice maps. But real pictures from a real webcam beg to differ. From the Healy ice breaker on a research cruise. It spent the first 2 weeks of its journey going in circles near Barrow Alaska trying to avoid the ice that exists there with as much vigour as the ship could muster. Now it looks like they are making a direct break for the pole. ship track archive (which they carefully expunge every few days it seems). That is what I have been trying to tell you. Rising temps cause CO2 to rise. But there is no measurable evidence of the reverse. So thank you for your opinion. Now, if you can provide a chart based on evidence such as Vostok or GISP-2 showing that rises in CO2 precede rises in temperature, I will be interested. But so far, the only scientific measurements show that CO2 lags temperature. So… post your evidence, please. Now, if you can provide a chart based on evidence such as Vostok or GISP-2 showing that rises in CO2 precede rises in temperature, I will be interested. But so far, the only scientific measurements show that CO2 lags temperature. So… post your evidence, please. Yeah, except for Snowball Earth transition. I’m curious, Smokey, can you specify another point in Earth’s history, even pre-Vostok/GISP-2, where humans, or other life forms, unearthed millions and millions of years worth of sequestered carbon deposits and combusted them into the atmosphere? That might provide a comparable circumstance to current times. As you might detect, I don’t find your argument and position very persuasive. First, you show me verified global harm that has resulted from the rise in CO2. Otherwise, you worry about something with no scientific evidence. You might as well worry about witch doctors. Me, I’ll worry about things that matter. The historical climate indicates that CO2 sensitivity is either 1.5C per doubling or CO2 is not related to the temperature at all. I have all the numbers. Is there any way mw can tell surface water from open water? You appear to be trying to “move the goalposts”. I was disputing your claim that the increase in atmospheric CO2 over the past 100 years or so was the result of warmer temperatures. I am saying that you are not correct on this and that the main cause of increased CO2 concentrations is due to fossil fuel burning. At no point have I stated about how much warming might result from increased CO2. However, like a number of responsible “sceptical” scientists (e.g. Lindzen, Jack Barrett etc), I do believe that an increased atmospheric CO2 concentration – particularly in the higher, colder, drier regions of the troposphere – must invariably produce some (possibly modest) warming. In the absence of any feedbacks the earth is likely to be about 1 deg warmer than it would otherwise be following a doubling of CO2. and therefore will withdraw your remark. Records are fun, but it’s the trend that matters. If I had to pick a turning point it would be when WUWT predicted 4.9 for ice extent this year. 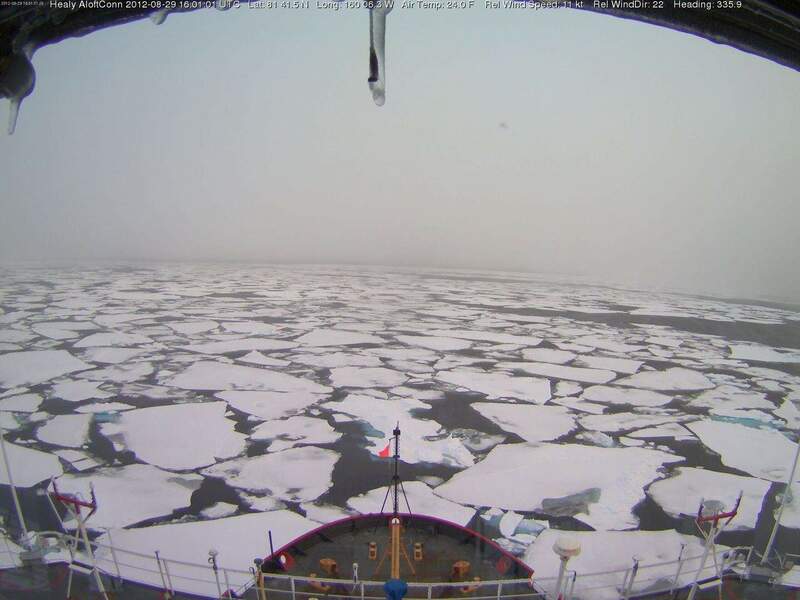 So much for Anthony’s “sea ice is recovering” theory. That was the “horse meet water” moment. I’m unsurprised he refuses to drink. Masie is at 4.1M km^2 as of yesterday 8/29. Here’s the page that Ron C is coming from. Select your month and year and submit. Yeah, that big storm and consequent smaller ones over the same area sure did a number on the ice. A quick rebound (refreeze)in extent would not surprise me one bit in the Chukchi Sea and East Siberian Sea with the ice(albeit low concentrations) still floating around. Nicely done. Your efforts have successfully contributed to the delay of any action on C02 emissions. I fully expect you’ll still be saying “let’s wait and see” even after the Arctic goes ice free. The fossil fuel industry owes you a royalty cheque. Does the low ice area cover have anything to do with the wind patterns associated with the unusual jetstream path this summer which has brought the UK the wettest summer since 1912? Royalty check? Are you saying Anthony Watts is a paid writer under contract to “the fossil fuel industry”? It’s interesting that sea ice loss automatically gets blamed on warming, even though DMI shows no warming in the polar summer over the past 50 years. It actually shows a modest cooling. But the loss of sea ice will open up a lot of dark surface to absorb heat and re-radiate during the polar winter. Almost like a pan-arctic heat island effect! 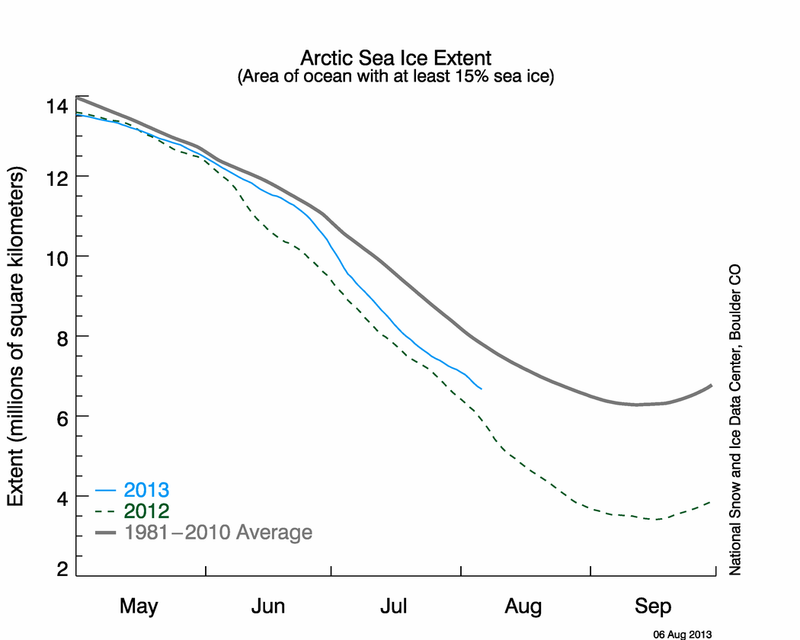 The ice loss is causing the observed arctic warming, not the other way around! The ice loss is probably due to soot emissions from China, because it started spiraling down right during the Chinese industrial revolution. Before that ice cover is thought to have been fairly steady. It’s this heat island effect that’s causing the arctic warm to more than the rest of the globe. For all of its many adjustments, GISS and NCDC have never adjusted for the effects of lost ice on the temperature to more adequately determine how much of the warming can be ascribed to CO2! 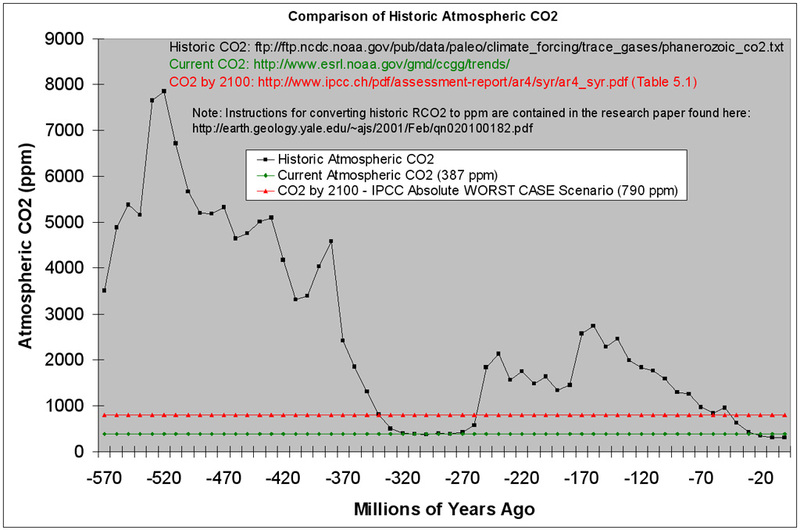 The fact that CO2 allegedly haven’t been this high in 500,000 years is immaterial to the debate. The debate revolves around whether CO2 causes CAGWism, and there’s no evidence it does. The earth has been Co2 starved for the past 500,000 years. More CO2 is generally better for life. See co2science.org. What has happened to the links to the HYCOM graphics (Arctic SST, Extent, Thickness etc.)? Nothing is showing up in the Sea Ice Page and the graphics cannot be accessed using the posted links. Scratch that, it has reappeared! It has been missing for a couple of weeks and there had been rumours on the web that it was now paywalled. No explanation as to why it disappeared and / or why it is now back. No, this debate with Smokey revolves around Smokey’s erroneous assertions that Arctic seaice has been as low or lower than now regularly in the recent past, and he has specifically stated that “CO2 levels are about as low as they have ever been”, which I rebutted. Pay no attention to Phil. He cannot even understand the chart I posted. Sure, harmless, beneficial CO2 has risen from its absolute lows. But it is still right at the bottom of its geologic range. And since CO2 levels up to twenty times higher caused no global harm, the only rational response to the recent, relatively minuscule rise [the green line] is that CO2 has not caused any global harm, either. If it has, post your evidence per the scientific method, showing global harm due to CO2. Make sure it is directly connected to human emissions, and show exactly why and how. Otherwise, the 31,400+ co-signers of the OISM Petition are correct when they state unequivocally that CO2 is harmless and beneficial. Who should we believe, thirty thousand scientists, including more than 9,000 PhD’s, all in the hard sciences? Or… Phil? The best part is when you discount the satellite record as being too short a time period (only 33 years.. though for UAH, or RSS sat temps that’s OK)… and in the same post wax on about how MASIE and IMS, which have been up for last than 10 years… shows different numbers. Meanwhile, NSIDC is not the only place to go for long-term ice data… they’re simply the latest to show a record because of how they average out the days. Others have seen this coming for over a week. Face it fellows, the Arctic is a shadow, quite literally, of it’s former self. When it walks like a duck, talks like a duck, flies like a duck, quacks like a duck, waddlies like a duck, swims like a duck, dives like a duck, fishes like a duck, and paddles like a duck. It’s a duck! Unfortunately it’s Smokey who doesn’t understand it! “CO2 levels up to twenty times higher caused no global harm” he says, of course that was when there was no life on land. Considering that the rain would have the pH of vinegar not too surprising. Only 15% O2 in the atmosphere not too healthy either! The jump in CO2 after that corresponds with the Permian-Triassic extinction event. Shortly thereafter there’s another jump in CO2 and another extinction event, the Triassic-Jurassic. A few years back Steve Goddard at The Register learned about the dangers of trying to interpret NSIDC charts without a full understanding of them. The Editor at The Register, and Steve Goddard, added retractions to that web page, stating that NSIDC got it wrong and that Goddard’s alternate interpretation was off the mark. In any case, why wast a lot of time on charts when you can see the melt down for yourself? Water normally combines with carbon dioxide from the air to form a weak carbonic acid solution. Atmospheric CO₂ concentrations of 350ppm would yield a 5.6pH solution from distilled water left exposed to air. At 25 times a 400ppm concentration, the pH would be 4.9. Common distilled vinegar, aka white vinegar, runs about 2.4pH. With the logarithimic nature of the pH scale, that’s around 320 times the acidity from a CO₂ atmospheric concentration more that 25 times current. Comparing the graph from Smokey with the timeline of life on Earth, land animals were present with CO₂ levels about five times contemporary values, far in excess of the IPCC’s absolute worst case scenario by 2100. Indeed, after lowering to current levels for between around 330 to 270 million years ago, CO₂ levels then significantly rose, only lowering to “worst case” about 50 million years ago, and to about current levels around 35 million years ago when grasses evolved and grasslands expanded. Yet despite the CO₂ levels being so far in excess of current amounts, even in excess of “worst case” from around 260 to 50 million years ago, life went on. Go figure. Thank you for providing this display of your scientific knowledge, it was quite enlightening. Thanks for trying to educate Phil. It won’t do any good in his case, but other readers will see where he went off track. Phil doesn’t understand Occam’s Razor, or the null hypothesis, or even the scientific method. But he does have a religious belief in CO2=CAGW, and for Phil, that is enough. Happened on Aug. 24, four weeks earlier than 2007’s minimum, and it happened despite a very slow starting melt season. And it’s still dropping, with at least 2 or 3 weeks left in the melt season. I will remind you that Smokey said: “CO2 levels up to twenty times higher caused no global harm” as I pointed out there was no life on land under those conditions! ‘Life going on’ is not the same as causing ‘no global harm’. oops, ims close to a new record!!! MASIE is down to 4.0 mil sq/km, a bit higher than other indices, but this value is lower than previous records for NSIDC, IJIS and Arctic ROOS extents. So I think that’s MASIE down for the record books. IMS looks like its inevitable to break the record soon. I wonder how WUWT will comment. I guess it will suddenly be remembered that weather isn’t climate. But will the full 33 year trend rate a mention? Or the longer-term data sets and the trends they reveal? No, if we start looking back in time I guess we’ll forget again that weather isn’t climate and pull out a few years in the 30s. Once you know the steps, the dance isn’t that hard. “CO2 levels up to twenty times higher caused no global harm” he says, of course that was when there was no life on land. Considering that the rain would have the pH of vinegar not too surprising. But given the acidity range of the various available vinegars, and comparing that to the range of “acid rain”, as seen on the pH scale I linked to, it’s clear we already have rain the pH of vinegar. I will remind you that Smokey said: “CO2 levels up to twenty times higher caused no global harm” as I pointed out there was no life on land under those conditions! But you tied that to how “the rain would have the pH of vinegar”. That condition already exists, has existed. The resulting soil pH is tied to the local amounts of natural buffering. Evolution has given us a wide range of land plants that prefer different levels of soil pH, with acidity overwhelmingly preferred. So why make the big noise about “no life on land under those conditions” when “the rain would have the pH of vinegar”? In case you missed it, life on land evolved with a preference for acidity. The relatively small decrease of rain pH from CO₂ levels 20 times current would be effectively not noticeable, as life survives and thrives with worse. You took the bait I had dangled, going right to the “apple cider vinegar” part I had already seen at the link I had provided. Good job. ‘Life going on’ is not the same as causing ‘no global harm’. True in an absolute sense. The slight decrease in rain pH wouldn’t matter. But 20x current CO₂ levels would cause marked differences in the distributions of plant species, with more trees, more grasslands in marginal arid regions as water requirements decrease with increased available CO₂, etc. How such a marked increase in CO₂ would affect life on Earth starting with the species we have today and whether it would be a net harm or a benefit, well, that’s the sort of work researchers can build entire careers on. Let’s see, warming from 1998 to present is 0.53C/decade for Arctic ocean sea surface temps. And that’s also the trend for the whole satellite period. Perhaps some of the warming expected from increased GHGs has gone into melting the NH sea ice (and global glaciers), as well as into the deeper oceans as postulated. Surface temps are a one-dimensional view of where the heat may go in the system. But NH sea ice is probably not in equilibrium with the warmer temps there, so even if temperatures stopped going up in the Arctic, summertime retreat would probably keep going for a few years. There’s little doubt now that the pack has been markedly thinning over the years. MASIE now says 4.0 million km^2 for Sep 1. “Let’s see, warming from 1998 to present is 0.53C/decade for Arctic ocean sea surface temps. And that’s also the trend for the whole satellite period. That expected warming has not been there for the last 15ys, so perhaps the Arctic warming is being balanced out by the Antarctic cooling, as postulated. It seems to be largely driven by the increase in frequency and magnitude of negative NAO periods, which does not equate with global warming. I don’t understand that, either. Several sites I’ve been to, warmists are gloating about this years melt. Happy as all get out about the new low, despite their “concern” about the shrinking ice cap. The only thing that would probably make them happier is if hundreds or thousands of dead polar bears were now appearing. IMS looks like its inevitable to break the record soon. I wonder how WUWT will comment. I guess it will suddenly be remembered that weather isn’t climate. Really? All summer long all we have heard from warmists is that weather=climate. I can’t think of any weather event this summer warmists haven’t connected to climate change. The problem is that the alarmist crowd has been allowed to frame the debate as: Arctic ice melt is caused by human emissions. That is complete nonsense, of course. Antarctic ice is growing. And whenever I ask wild-eyed arm wavers like barry to show a connection between human activity and ice melt, all I get is more arm waving. When a claim lacks any evidence at all, the probability is extremely high that the claim is false. And keep in mind that we have only nineteen (19) more days until Arctic ice is gone. Now, post your evidence, per the scientific method and using raw data, showing that the decline in Arctic ice is caused by human CO2 emissions. You made the claim, now let’s see you back it up with testable data. While you’re at it, show us how CO2 molecules go into Arctic ice and avoid Antarctic ice. I want to see you try to defend that nonsense. The only reason that the natural Arctic ice cycle is an issue is because it is the one (1) prediction the alarmist crowd believes it got right, out of hundreds of failed predictions. But even a broken clock is right twice a day, and the entirely natural ebb and flow of Arctic ice has happened repeatedly. As recently as 1987 the Arctic was more ice free than now. 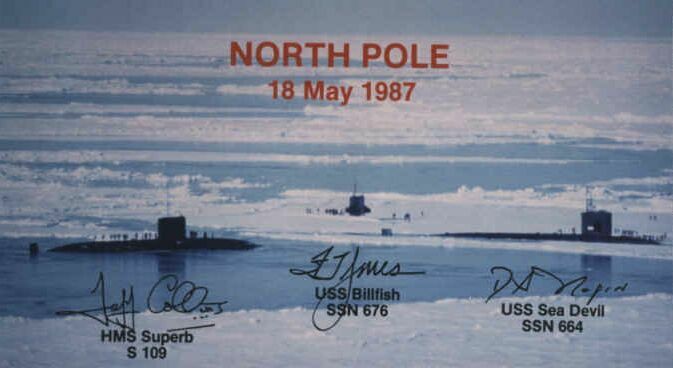 And in the middle of winter in 1996 there was more open water at the North Pole than now. You are fixated on Arctic ice levels because it feeds your belief system. But observations show decisively that the current Arctic ice level is nothing unusual. Throughout the Holocene the Arctic has been as ice free, and more, than it is today. Today there is plenty of Arctic ice. The current cycle is normal and natural, and anthropogenic CO2 emissions have nothing to do with it. If you can prove me wrong by posting testable, empirical scientific evidence, per the scientific method, I will sit up straight and pay attention. But you will be the first, and I very much doubt you possess evidence that no one else has. Face it, barry, yours is a belief system, not science. That is complete nonsense, of course. Antarctic ice is growing. Really, how about some evidence for that claim? Prior to the late 1970s there was a significant drop in Antarctic seaice. The only reason that the natural Arctic ice cycle is an issue is because it is the one (1) prediction the alarmist crowd believes it got right, out of hundreds of failed predictions. But even a broken clock is right twice a day, and the entirely natural ebb and flow of Arctic ice has happened repeatedly. How about you show some testable scientific evidence for that statement particularly that ” the entirely natural ebb and flow of Arctic ice has happened repeatedly”, Smokey? As recently as 1987 the Arctic was more ice free than now. 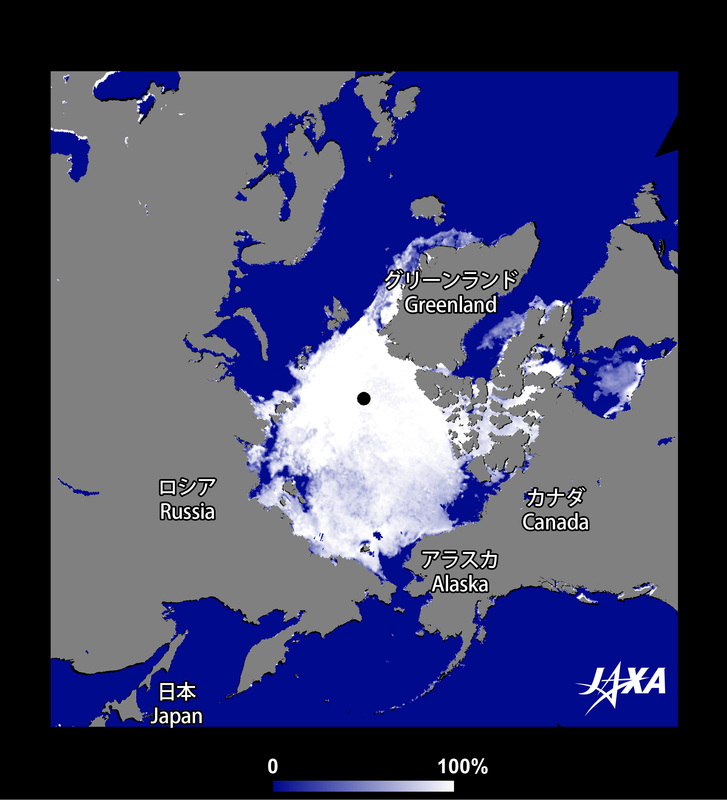 And in the middle of winter in 1996 there was more open water at the North Pole than now. Produce some evidence for that claim too, not that the 1st of September is Mid winter, in fairness John Daly’s site where you got that photo from does not claim that merely using as an illustration of “typical pack ice”, as usual you have misquoted your source! You are fixated on Arctic ice levels because it feeds your belief system. But observations show decisively that the current Arctic ice level is nothing unusual. Throughout the Holocene the Arctic has been as ice free, and more, than it is today. Again let’s have some evidence for that, particularly ‘throughout the Holocene’, the available evidence is that the current seaice level is unusual. Today there is plenty of Arctic ice. The current cycle is normal and natural, and anthropogenic CO2 emissions have nothing to do with it. Current cycle of what? Evidence? 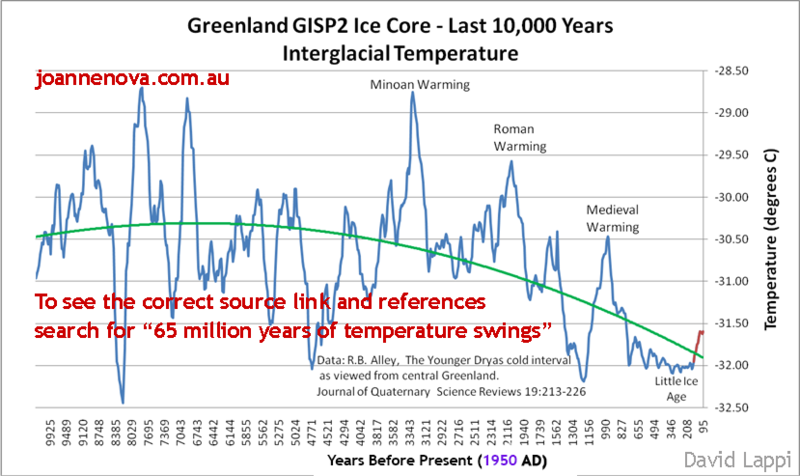 The graph you post is of temperature not seaice and as has been pointed out to you before has an incorrect time axis. Since you continue to link to this graph without pointing out the error I assume you’re attempting to deliberately mislead readers. Done many times, but you will ignore it as usual. Face it, Smokey, yours is a belief system, not science. And as usual, Phil produces no evidence, per the scientific method. Just Phil’s baseless opinion, nothing more. Someone please wake me if/when Phil produces testable evidence of a direct connection between human produced CO2 and the natural Arctic ice cycle. So far, Phil has emitted his opinion, nothing more. That is not science, that is only belief. “Seasonal” ice being ice that is *not* multiyear. ie. it melts in summer. Observational data is proving this out. The multiyear ice is quickly disappearing and as of 2011 and 2012, ice that is 3 years or more years old is gone and ice between 2 and 3 years old is effectively gone. Smokey, take a look at the arctic now that there is big breaks in the clouds to the north of the Bearing Sea. The current view is still Sept. 3. You’ll have to really zoom in to see all of the ice many agencies say is not there at all. That is where the missing ice went to. Checked Realclimate. They posted an article about this but no mention whatsoever of the Super Cyclone breaking up the ice which contributed to the loss. No mention whatsoever of the Super Cyclone in the first 75 comments, either. They’re acting like the cyclone never happened. While satellites measure lower troposphere radiance above land, they measure sea surface radiance from the ocean skin (where cloudiness doesn’t interfere, for infrared sensors; microwave can penetrate clouds). Yes, although the time periods are too short to say much with confidence (the trends fail statistical significance tests at these time periods), it appears that when the global trend flatlined from 1998, the Arctic trend, which has been relatively little from 1979 to 1997, suddenly roared into life. As ~8000 cubic kilometers have melted away since 1998, then some of the heat not seen is surface temps globally since that time has perhaps gone into melting the ice there, as well as land glaciers around the world (85% have been receding), and, as theorized into the ocean depths (OHC to 2000 meters appears to have an upward trend from 1998. Missing heat? Maybe. The thermal capacity of the boiosphere is hardly limited to surface temperatures. Which warmists have connected every weather event to climate change? Can you name one weather event that ‘warmists’ (preferably scientists – the press sensationalise all over the place as we all know) have said is a result of climate change this summer? Here’s one scientist who thinks the record is ‘just a number’, and points out the longer term behaviour as being significant. One cannot claim it was just the weather, that is patently ridiculous. If you compare just the two record years, 2007 and 2012…. 2007 actually had a far more severe pressure pattern that compacted the ice and ejected out Fram strait nearly the whole summer. But even that doesn’t explain the amount of melt in that year it just helped it along. Yes, the 2012 cyclone certainly did do damage, however 2012 was already setting up below 2007 and has had a normal weather pattern nothing like 2007. Ice was already at record lows, before the storm, and kept marching after the storm as well. It can also be argued, very strongly, that the storm is a symptom, not a cause. It is a classic case of a manifestation of the newly opened sea ice, warm waters, and weather that can result. It is, in effect a reinforcing feedback caused by the decline of the ice that will cause yet more decline by damaging and dispersing the ice pack. But as others have said, it is volume that is the real elephant in the room. The extent and areas certainly matter and are the most visible change but it’s the loss of the multiyear ice that has caused the decline to stick over the past decade. 60% in a decade. Just as multiple studies predicted in the late 90s and early 00s, as the Arctic warms, the sea ice is becoming seasonal. Mathematical plots have the PIOMAS volume going down to Zero in September by as early as next year but more likely around 2015 with August and October not long after. That ain’t just ‘the weather’. Anyone who says so is, well, dead wrong. I can hardly wait to hear what blogs and commenters like at WUWT will say when the ice finally melts away completely. Of course first there will be the required argument about what’s “completely”….. They don’t mention attribution at all, just give figures. They do link to the NSIDC announcement I linked above, which mentions the cyclone. When news of the cyclone first arrived at WUWT, brought by visitors from Neven’s blog, it was downplayed as just another storm, with a frequency in summertimes of 1 in 4 years, as a couple of posters put it. Now that records have been broken, the storm is cast here as a ‘supercyclone’. Suddenly the storm is no longer ordinary. But if storms like this do come once every four years, then why haven’t we seen retreat nearly as extensive as this summer’s over the last several decades? Because there has been a long-term decline in sea ice, pre-conditioning the pack for such events. Summer weather conditions in 2007 were even more favourable to sea ice retreat than this year’s, and that year, to saw a record-breaking minimum – a combination of the long-term trend and weather patterns for that year. It aint the storm, it aint the weather, and it aint even the long-term trend that makes a record-breaker. It’s a combination of trend and weather. And it’s just a number. What really matters is the trend. And the metric that really matters for analysing sea ice change in the Arctic is not extent or area, it’s volume. Area and extent changes, even year on year, are indicators. Amusing. Anyone checked on the IMS recently? Is that perhaps a typo? Oh, there must be a good explanation.